AM radio stations require very large antennas. We received an interesting email from reader Phil today, and on the basis of ‘If one person asks a question, probably a thousand others are wondering the same thing’ we thought we’d quote his email and our replies and share it with all. Not to rain unduly on Phil’s parade, because the questions he asks are sensible and his hoped for answers seem to be intuitive and easy, but unfortunately, that is not the case in the real world. These things are all more complicated than they seem. We show Phil’s questions in italics and our responses in normal type. Go to Google and type: “CB Channel 6 illegal power” (or just click the link). According to these results-pages, CB channel 6 (27.025 mhz AM) is commonly used by certain CB broadcasters using illegal amplifiers and transmission-power levels. I’ve heard these guys myself. The broadcasters claim to live in Jamaica, Barbados, Tijuana and Hawaii. Sometimes they have conversations with each other. They can broadcast Continentally. Here is an idea—In darker times, these CB owners could broadcast news and information across the entire North American continent. Such a broadcaster would need the equipment already in place before darkness fell, and they would need the willingness to break any laws restricting free press broadcasts of truth. These guys already have all of that. Has anyone contacted them and attempted to recruit them? How hard would it be for patriots to acquire, secure, and set up the same equipment? A patriot in a downtown big-city apartment probably couldn’t do it, but there are plenty of patriots in the rural areas and Redoubt who might be able to. Could you write an article about setting up and running such an amplified CB transmitter? It’s not illegal to tell people where to buy the equipment and how to set up everything. It’s illegal to key the microphone once everything is connected and running—but on the day when these stations will start broadcasting, we *won’t care* about Big Brother’s laws anymore. In the absence of a free press, word about a news broadcaster on the CB will spread like wildfire and people will start digging up those old CB radios out of their garages and attics. The long distance CB broadcasts you hear are produced by what is called ‘skip’ propagation. Although an essential part of radio communications at some frequencies, it is unreliable and random at CB frequencies. Skip is an atmospheric phenomenon, and is not a function of the power of the transmitter. Sure, more power is usually a good thing, but skip is totally dependent on when the atmospheric conditions are in place to allow the radio waves to bounce back down to the ground again rather than just being absorbed or shooting into space, never to be heard from again. By reaching into the dregs of distant memory, I vaguely recall working skip on 2W, too many decades ago, myself. Skip doesn’t need high power, just good fortune with the atmospheric conditions – google ‘CB skip‘ for lots of info. And therein lies one of the problems with skip. The likelihood of a skip ‘window’ for CB frequencies opening up is difficult to predict, and ultimately is linked in with sunspot activity (which goes through an 11 year cycle), and in the US seems to be seasonally better from late spring through early summer than at other times of year (and that’s a very short season, isn’t it). CB skip is patchy – it doesn’t blanket an area consistently, but comes and goes depending on which bounce angles will cause the radio waves to be refracted back from the ionosphere, and there will be dead zones – for example, you might have direct communications with someone a few miles away, then nothing for 100 or even 1000 miles, then a skip zone, then again nothing (then maybe a second skip zone). CB skip (and indeed much of the rest of CB too!) is also a bit chaotic. Again, reaching into the dregs of memory, as I vaguely recall, there would be dozens of signals all piling on top of each other, and no type of organization or orderly sequencing of who was to speak next. Indeed, the ‘free for all’ nature of CB radio in general and the congested channels and the idiots who delighted in blocking channels or sending extended offensive or nonsense transmissions was a significant part of why CB radio ceased to be a popular thing back in the late 1970s. One more thing – although this is widely ignored, the FCC says it is illegal to work skip with a CB radio, because CB is designed for only local communications. Because skip for CB purposes is unreliable and unpredictable, and because CB radio in general lacks quality control and reliability, it would not be a good base for any sort of emergency or essential communication. Lastly, I’m not sure how many people have CB radios in an attic or basement, and even if they did, do they still have an antenna? Will the radio still work (electrolytic capacitors in particular have a finite life of 20 – 30 years)? How hard is it to set up and maintain a shortwave station? Lots of shortwave stations are run by cash-strapped religious organizations, poor third world governments, and communist nations like Cuba that have strangled economies—yet they have shortwave stations. How do patriots put one of these stations together and get them broadcasting in a crisis? I saw the movie “2012” recently. Woody Harrelson played a conspiracy-theorist shortwave broadcaster in the show. He died while broadcasting from his backpack as Yellowstone exploded around him. Is that backpack for real or is it fiction? Can a patriot broadcast news and events on shortwave using equipment that be stuffed inside a large backpack with a couple of antennas? Such a setup would be perfect to broadcast news, events, instructions, and coded messages from a mobile broadcaster that might never be tracked down and captured by enemy forces during darker times. Could you write an article about setting up a shortwave station and/or one of these broadcasting backpacks, and how to avoid capture while using it? Rather than a backpack, maybe put everything in a car? Most cities and even large tracts of rural areas already have local AM radio talk show hosts breathing fire into their microphones each day. Has anyone tried to recruit these guys? The radio stations are already in place and operational, and nearly every house and car already have an AM radio somewhere inside them. The bad guys might capture the stations in the cities, but there are hundreds of stations in the rural areas that would be out of reach. Plus, the owners and operators of those super-power CB stations could donate their amplifiers to the rural AM stations so that people across the nation could be reached. Even broadcasting inspirational, patriotic, or uplifting sermons and masses would be valuable during dark times. Let’s look at your second comment in two parts. First, the ability to broadcast AM transmissions from a backpack. Unfortunately, the backpack radio concept (or even car radio concept) suffers from two very big problems. The first problem is power. Broadcast stations transmit using many thousands of watts of power, sometimes 50kW or more. A heavy (ie approx. 50lb) golf cart type battery would support a 10kW transmitter for maybe five minutes of operation (or a 1kW transmitter for about an hour, if you prefer). You can’t carry enough power in your backpack to run a transmitter for any appreciable length of time. In a car, maybe you could get a super-sized alternator that might put out 300 amps, and that would give you 4kW of power, probably enabling you to run perhaps a 2kW transmitter. Or it would be easy enough to load a 10kW or thereabouts generator into the back of a pickup and then you could power a 5kW transmitter – that is starting to become workable. So this part of the concept could be feasible for a larger vehicle, but not for a car and definitely not for a backpack. The second problem is antenna size. You need an enormous antenna to transmit on an AM broadcast frequency. An AM radio signal requires, well, lots of possibilities, but let’s just say ideally a 500 ft antenna. Shorter antennas will work, but need more power. You’re not going to have that sort of antenna stuffed in your backpack, either, or mounted on your vehicle roof (the weight of the antenna would be too much for the roof, the whole vehicle might topple over, and so on). There would be one interesting possibility. You could attach an antenna wire to a hydrogen filled balloon and have the balloon lift the antenna wire up the 500 ft or whatever it was. If you used perhaps 18 AWG wire, 500 ft would only weigh about 3 pounds, so that is a possibility with a big enough a balloon, but you’d not want there to be much wind, so it would be weather limited. This type of setup could work and from a suitable location would give you reasonable regional (but not national) coverage. A problem is that it is not legal, and getting an FCC permit would be close to impossible. As for co-opting existing AM stations (and it isn’t the hosts as much as the station owners who would have to sign off on the deal), a couple of thoughts. First, it is reasonable to assume that in any sort of regional or national emergency, all broadcasting outlets will be doing whatever they can to reasonably add value and assist with the situation already, and will be answerable to FEMA and Presidential command notices. Second, depending on the nature of the emergency, will regular AM broadcast stations be able to transmit? 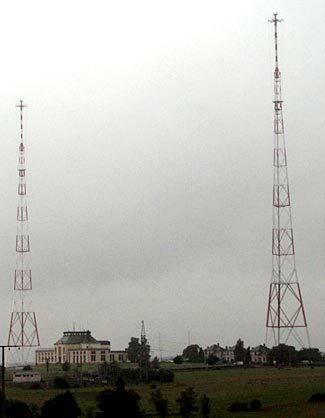 To transmit they need power in their studio, an intact communication link to the transmitter, power for the transmitter, and then the antenna tower still standing. If any one of those four things fail, there’s a problem. Smaller regional stations are – well, smaller and regional, and perhaps less likely to be fully disaster resilient. Oh – the ‘super-power CB amplifiers’ that you are suggesting could help out? They probably would not work on broadcast radio frequencies (AM radio is from 0.5MHz – 1.7MHz, CB is around 27 MHz, and their ‘super power’ is typically less than 1kW. That’s comparatively super when you think the maximum permitted power on CB is 4W, but when you compare it to a radio station that normally transmits at 10kW or even 100kW, it isn’t quite so super. Now for the second part of your suggestion. Shortwave broadcasting is great, because it truly can circle the globe. Indeed, sometimes it does do exactly that (‘long path propagation’) where you can get a better signal from a transmitter by pointing your antenna in the opposite direction and getting the signal ‘the long way round’ the world. Shortwave broadcasting need not be unduly expensive (the biggest cost is the cost of employing staff and developing programming) and even the poorest countries seem able to lavishly spend on their elected or unelected leaders, etc. 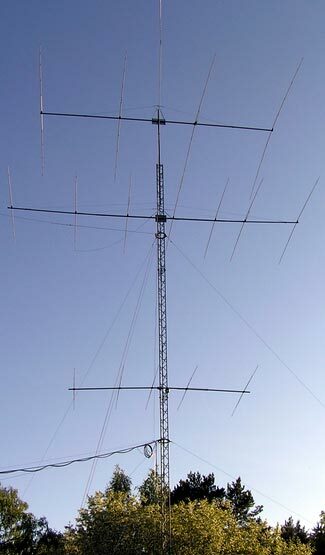 It is also more practical, requiring shorter antennas and allowing for less transmitter power, too (we know hams who have successfully spoken to other hams, many thousands of miles away, using only 10 or 20 watts of power using directional sending and receiving antennas, but national shortwave radio stations are generally very much more powerful). How would patriots put a shortwave radio station together? That’s the comparatively easy part of the equation; the harder part is how would other patriots receive the station’s broadcasts? How would they know what frequency to listen on? Would they have a suitable shortwave radio and antenna? There just aren’t all that many people with shortwave radios out there, and even fewer with good ones capable of picking up weak distant signals. For those who are out there, how would they know which frequency to listen on and when to listen on it? Even the comparatively easy part is not all that easy either. The FCC forbids ham/amateur radio operators from ‘broadcasting’. We hams are only allowed to have direct person to person type communications, we are not allowed to broadcast content to many people. You’ll see we’ve used the FCC restrictions as one (of usually several) reasons why neither CB, AM, or shortwave broadcasting would be practical. Okay, so for sure, in a major collapse of society, an FCC regulation will be the least of anyone’s worries (including those of FCC staffers! ), but prior to that time, how can you set up, test, and get fully operational a system that contravenes FCC regulations? And after that time, when things hopefully return to normal, do you want FCC officials knocking on your door, handing out $10,000 fines and possibly imprisonment terms (the FCC can be very severe in enforcing its regulations)? One more thing – radio communications are considered as a strategic and military resource, and as a key part of any emergency response coordination. One of the first controls put in place in World War 2 was a blanket ban on ham radio throughout the US, for fear that enemy spies would sneak transmissions unnoticed into the general cacophony of other transmissions. So even during an emergency, it is possible that some remaining shreds of federal, state, county and local government might be focused on policing the airwaves, and the last thing you want to do is to call attention to yourself any which way in such situations. We consistently urge people to plan their prepping based on compliance with as many – and hopefully all – currently in place laws, regulations, and other requirements and constraints as is possible. Failure to do so exposes you to liability before, during and after any emergency situation, and we’ve seen way too many examples of enforcement agencies of all types choosing to blindly enforce the extreme letter of the law, no matter what common sense and fairness might suggest to the contrary. How about a communications network of individual operators comprised of volunteer ham and CB users? The network would be like an underground railroad for personal messages. It could be organized like a Neighborhood Watch phone tree—except that it’s state wide. It might take two weeks to get message from California to Maine, but at least a system would be in place. Such a network could help reunite families, spread news and coded messages, and return freedom fighters who were separated during missions and are presumed to be dead or captured. If a nightmare ever happens to the United States, these ideas could have an alternative media and communications network already in place and ready to go into operation immediately. This is a moderately good idea, and is sort of in place at present. Indeed, the oldest ham organization in the country (if not the world), is the ARRL – those letters stand for the American Radio Relay League. The concept of using a network of ham operators to relay messages from somewhere to somewhere else was one of the originating purposes of ham radio. It was a viable and valuable service back when not everyone had land-line telephones (and no-one had cell phones), and when long distance calling was many dollars a minute. But nowadays it has largely died out, due to the ubiquity of cell phones. In normal times, no-one needs to relay a message because they can do it directly. There used to be a time when ham clubs would have booths at county fairs, offering to relay messages to friends and relatives in other parts of the country or world, and there was a certain amount of ‘gee whizz, isn’t that amazing’ to the concept, both for the people at the fair and the people who subsequently received the brief telegraphic type messages. But these days, people at the fair are realtime sending text, pictures, tweets, updating Facebook, and so on. A ham radio relay service seems slow, clumsy, limited in scope, and every way ‘old fashioned’. Ham radio as a whole is in a strange sort of no-man’s land at present; a lot of people who a decade or two ago would have been hams are now enjoying all sorts of other internet based communication concepts instead. This might be changing – new low-priced radios like the Baofeng UV-5R might be creating a resurgence of interest on the VHF and UHF frequencies (but these are essentially local rather than long distance services), and new interfaces between the internet and radios are allowing for hybrid half-internet and half-wireless type communications too, although of course in an emergency, the dependence on the internet would probably see such activities fail. For wireless-only long-range work and relaying, you still need expensive HF radios and large-sized antennas, and you need a more difficult to obtain General ham license rather than the easy to pass Technician license. There are two more issues about using a relay of ham operators to send messages across the country. The first is that this would be a very limited service – how many messages a day could be sent across the country? We don’t know, but we’ll guess maybe 10,000 maximum, and probably many fewer (depends on the number of hams participating). That’s not a lot in a country of 300+ million people. The second is the ‘last mile’ challenge. How does the originator of a message first get it to a ham operator who will then wirelessly transmit it on to the next ham and so on across the country? And, at the other end, how does the last ham in the chain get the message to its intended recipient? Clearly, the phone would not be working or else there’d be no need for the radio relay. And probably cars would be not working either due to gas shortages. There are some existing organizations that coordinate ham radio operators into emergency response plans. The leading two are the ARES program coordinated by the ARRL and the RACES program coordinated by FEMA (and, more generally, their CERT program). In addition, there is a prepper type radio network of sorts, Radio Free Redoubt. So there are some services and coordinating groups who are already working to provide some types of emergency radio services. Now – may we offer a gentle observation? Your suggestions are interesting and creative, but they all embody the concept of someone else doing these things, for you and for others. Why not become part of the solution, rather than remain part of the problem! Become a ham operator yourself, and then get some HF radio gear so you can send and receive across the country and world. Encourage your friends and family, wherever they are, to do the same, so that you don’t need to rely on ‘last mile’ relay challenges, but can instead directly contact the people you wish to remain in contact with. We have a page telling more about ham radio and why you should become a ham, and a two-part article that helps you to pass the ham tests. If I can manage to pass all three ham tests (and getting either all correct or only one wrong in each test), then for sure you can too! The UV-5R comes in different case styles and model numbers, but all are identical inside. If you’re reading this, you’ve probably either just purchased a UV-5R or are about to do so. Congratulations on a good choice. Like any other professional grade two-way radio, the UV-5R has an enormous amount of flexibility and versatility in terms of how you can program and use it. This is both a good thing and a bad thing. You can’t just take the radio out of its box, charge up the battery, and start using it. Although it comes with 21 simplex channels pre-loaded, you’re not likely to use any of them, and so you’ll need to program in and name the channels you want. Furthermore, you’ll quickly discover that the provided manual is far from well written. But, never fear. Solutions to all these issues are readily available. Let’s go through them more or less in some sort of sensible sequence. Do you have a recent level of firmware in your radio? There are some relevant improvements and bug fixes in newer firmware levels, and it is easy to check. Turn your radio off. Press and hold the ‘3’ key, and while holding it, turn your radio on. Release the ‘3’ key. You want your radio to be version 297 or higher. This software has been out since about Nov/Dec 2012, and if your radio has a lower version firmware, that means you’re getting old stock. More to the point, earlier version firmwares have some bugs in them, and – most to the point – the firmware in your radio can not be updated. We’d recommend that if you get a radio with an earlier firmware, you contact your seller and ask for an exchange for a more recent version radio, or simply return it if they can’t/won’t/don’t offer an exchange. This is one of the benefits of dealing with Amazon (the link takes you straight to their UV-5R page) – not only do they have great prices, and fast free shipping if you’re a Prime member, they also have great return policies. At the time of writing (April 2013), we are still occasionally hearing of people getting stuck with old stock radios. Don’t let it be you. Okay, so your radio does have recent firmware in it. Great. Now let’s fix the dreadful manual by getting you a very much better manual. 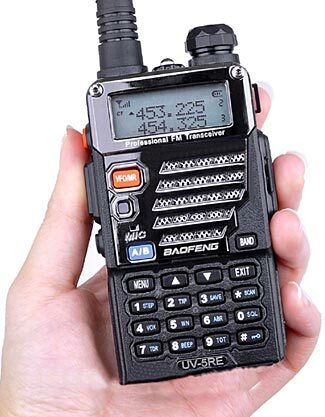 Click the link to download an improved Baofeng UV-5R manual. This improved manual was written by one person and then edited/annotated/corrected by a second, and between the two of them, is by far the best reference work for the radio currently available. Here’s a second link to a great ‘cheat sheet’ for the keyboard programming options the radio comes with (written by the same guy who annotated the excellent manual above). Grab a copy of that, too. Okay, so now you have an up-to-date radio and a great manual and keyboard (as in ‘the keyboard on the radio itself’) programming ‘cheat sheet’. The next thing you need is good software to program and manage all the radio’s settings and the 128 different channels that can be stored in its memory. This assumes you have already purchased a programming cable for the radio that connects between a computer USB port and the radio’s mike/speaker connector. If you haven’t done so, you’ll, about now, be discovering just how essential this is! Here’s a link to the programming cables on Amazon. Go and get one. Note that some cables are for the baby brother of the UV-5R – the UV-3R Don’t get that – it uses a different connector. And there’s no need to pay extra money to get the cable and software. Just get the cable, because the Baofeng software it comes with is only slightly better than the Baofeng manual the radio comes with. Again, you’re going to replace the inferior provided software with very much better, and free, software. Once you have your cable, go to the CHIRP website and download their software. There are versions for PCs, Macs, and Linux. The CHIRP software will enable you to program both the radio’s general settings (things such as squelch levels, backlight settings, scan mode, and so on) and also the specific settings for each of its 128 memory channels. You’ll find this amazingly easier and more straightforward than struggling either with programming the radio from its own keypad, or through the Baofeng software. Here’s a great guide to what the various CHIRP fields mean for programming the channels. Now for the fun part. There are 128 memories in the radio, and you can load frequencies of your choice into them. But what frequencies will you load in? We suggest programming some FRS/GMRS/MURS frequencies into the radio, plus some ham frequencies too (assuming you’re a bona fide licensed ham). These are discussed below. We suggest you use some sort of standard frequency numbering scheme – although you can (and should) also program frequency names, it is helpful to have some sort of self-interpreting channel numbers, too. For example, we have channels 1 – 9 for high priority high usage ‘general’ channels. These include the standard national calling channels (eg 446 MHz) as well as a few local repeater channels that give good coverage, and our own group’s calling channels. We then have channels 11 – 24 for FRS, 25 – 29 for MURS, 31-8 and 41-8 for GMRS simplex channels, and 51-58 for GMRS duplex channels. We have channels 61 – 99 for various other repeaters and specific channels for specific services, then channels 100+ for ‘interesting’ local channels we like to monitor (public safety, etc). The reason for naming channels is so that when you hear a transmission on an unfamiliar frequency, its name might give you a clue as to what you are hearing. Note that these radios are not ideally suited for scanning purposes – mainly because their scanning rate is too slow. By the time they’ve cycled through 100 or so channels and returned to channel one, more than 30 seconds has passed. This means you can miss entire conversations. If you really want to scan multiple channels, you should get a separate standalone high-speed scanner, or at the very least, get multiple UV-5R radios and program each one to only a limited number of channels. In several of our other articles about handheld radios we’ve discussed the grey legality of using these radios as FRS/GMRS/MURS radios. It is up to you how you personally resolve this issue, and perhaps suffice it to say that if you wanted to program the channels in to your radio so you could at least monitor and listen to the channels, that would be perfectly legal. It is only if/when you transmit that you possibly trespass to the dark side of the grey area. The good news is that the CHIRP software has these frequencies already available for you to copy in to your radio. Go to Radio – Import from Stock Config and select the frequencies you want and decide which channels to import them to. You’ll see that CHIRP has the eight GMRS repeater frequency pairs in its stock configuration. That is great for using the radios with GMRS repeaters, but if you wanted to transmit/receive on the frequency paired channels in simplex mode (ie both transmitting and receiving on the same frequency) you’d want to import the frequencies a second time and edit them to simplex using the transmit frequency, then a third time and edit them to simplex using the receive frequency. Note also the first seven of the FRS frequencies are the shared FRS/GMRS frequencies. Our article Explaining the Confusion of Frequencies and Channels with FRS & GMRS Radios provides some much-needed clarification on these matters. It is helpful to have all these frequencies programmed if you want to scan/monitor the frequency bands to pick up on other people nearby. But if you’re only interested in using the radios for your own use, then you don’t need every last frequency entered and maybe it keeps things simpler to just have a few frequencies stored in memory. Find out who your local frequency coordinator group is. If you have a copy of the helpful and annual (but not always up-to-date or complete) ARRL Repeater Directory you’ll find listings to local groups in the front; a bit of ‘detective work’ through Google and the ARRL site will often get you to the appropriate groups as well. Hopefully the frequency coordinating group has a website and hopefully you can download a set of repeater frequencies from them. The CHIRP software also links you to some online services (Radio – Import from Data Source) that have many of the local frequencies already in suitable format for you to automatically transfer over to your radio. If you do this, it pays to check the data with the local frequency coordinator group if possible – generally the local frequency coordinator group has the latest and best information to refer to. You’ll find it helpful to understand which repeaters you can access, and you’ll want to build up an understanding of the coverage areas of such repeaters. In the event of an emergency that does not immediately destroy such repeaters, they will be one of your preferred means of communicating with other members of your group, especially if some of the group are not within direct/simplex range. Usually the repeater listings tell you approximately where the repeaters are located, so that gives you a good helpful start to understanding which ones might be relevant – both around your local normal area where you live and work, and on any routes from there to where your retreat is, and of course, repeaters in/around your retreat. It is hard to know whether repeaters will remain operable or not in any sort of emergency scenario. If the repeater is only powered from mains/grid power (perhaps with an hour or two of UPS battery as backup for brief power cuts) then clearly, as soon as it loses power, it goes down, and it stays down until mains power is restored. But if the repeater is solar-powered (and an appreciable number are) then it is much more resilient to interruptions in the normal world. You should find out about your local repeaters, and maybe join the appropriate groups/clubs that own and maintain them, and subtly lobby for making the repeater grid-independent. You’ll actually find you have a fair measure of support for such concepts. While not all hams are preppers, many enjoy the thought of being able to participate and assist in minor regional emergencies – temporary Level 1 type scenarios, and within that concept, the idea of making a repeater as robust as possible will find plenty of support. You can use resources such as www.radioreference.com and www.scannerstuff.com and www.mygmrs.com and www.interceptradio.com to get lists of local frequencies used variously by public safety, local, state and federal government, and all types of businesses from the local fast-food joint to mall security companies and just about every other type of radio user imaginable. It can be interesting listening to some of these frequencies, and you might think of some tactical advantages to being able to monitor some of them as well – both while life is comfortable and normal, and in an uncertain future if things start to go suddenly very wrong. However, remember that these radios are not fully featured when it comes to advanced scanning, and they can’t monitor digital or trunked frequencies at all. If these are things you want to monitor (and increasingly the more ‘interesting’ radio channels are on digital/trunked systems), you’ll need other equipment. At the risk of stating the obvious, just because you have a radio that is theoretically capable of listening and transmitting on any particular frequency, that does not mean that you are allowed to do so. Not a separate function, but an often overlooked capability, is to program in the NOAA Weather Radio channels. There are seven of them, in the VHF band. If you are getting low on spare channels, you could just program in the one or two for the areas you expect to be (the preceding link takes you to pages that list the locations and coverage areas for each transmitter); otherwise, it is easy to put all seven into your radio (and CHIRP has them preloaded to copy over – go to the Radio – Import from Stock Config option). 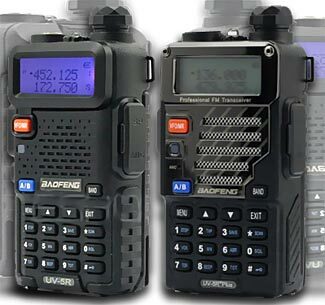 The Baofeng UV-5R series of radios will receive and transmit on FM modulated VHF frequencies between 136-174MHZ and on FM modulated UHF frequencies between 400-480/520MHz. It will also receive only (but not transmit) on FM modulated VHF frequencies between 65 – 108 MHz. First, to explain the UHF range. Many times the radios might be specified as having an upper range of 480 MHz, but (at least for the more recent firmware units) the upper range is actually 520 MHz. Trust us on this – we’ve tested to confirm. Second, there is a problem with very inexpensive radios being freely available. Sometimes people buy them who, ahem, probably shouldn’t. We regularly see ridiculous claims from people on websites, saying that they have managed to modify their UV-5R radios to receive (and presumably transmit, too) on other frequencies – not just slight extensions of the official frequency ranges, but all the way up to 1 GHz and down to only a few MHz. 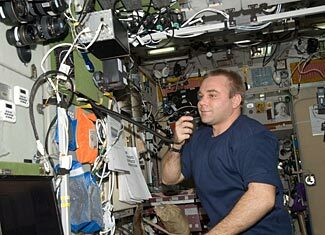 We’ve also read other people saying they have modified their radios to receive AM as well as FM signals. Both these types of claims are physically impossible, and are outright utter nonsense. We can’t comment as to the mental health of people who make such claims, but the unavoidable electrical and electronic reality is that – no matter what you can get the display on the front of the radios to show – they will not work outside the frequency ranges they have been designed to operate on. We will concede that with increasingly poor performance, maybe you could extend the two bands by about 5% – 10% at each end, but beyond that, the circuitry just will not work. And as for receiving AM signals on an FM radio, that’s also not electrically/electronically possible. We all like to get something for nothing, but don’t risk damaging your radios by trying these nonsense modifications. They can’t work, they don’t work, and they won’t work. In addition to being able to transmit and receive on its two bands, the Baofeng UV-5R has a bonus feature. It also has a good quality extended FM broadcast band receiver in it, which allows you to receive but not transmit on both the regular broadcasting FM band (88-108 MHz) and also on the 65-88MHz frequencies too. There’s not a lot of activity in the 65-88MHz part of the spectrum (that’s putting it mildly) and the radio only tunes in 100 kHz steps in this mode. However, the regular FM radio capability is convenient. You can’t store FM channels in the radio’s memories, but you can use the scan function to jump from one radio station to the next. The radio has a lot of configurable options, either through keyboard programming or via the CHIRP software. Most items can be left at their default setting, and the per channel items for each channel can be configured as is needed. There are a few settings to consider, however. The squelch setting can be varied from 0 (squelch off, you get all background noise all the time) up to 9 (very high squelch, only strong signals punch through). The radio is set to a default value of 5. Different people have different approaches and opinions about squelch, and you should adopt an approach that reflects your needs. If you only want to use your radio for local communications, then set the squelch level for one or two numbers lower than the level necessary to ensure that it always ‘opens’ when receiving signals from the furtherest away place with the poorest radio signals that you want to receive from. By having a higher number squelch setting, you’ll be less troubled by other weak signals, especially ones that many times are too weak to really understand. But if you want to hear the other guy’s transmissions before he hears yours, and if you want to be sure to pick up even very weak signals, just for the knowing that there are other people out there, even if still some distance away, then set your squelch down to 1 or 2. We generally have our squelch setting at 1, and find that we can understand most of the transmissions that come in. We want to know who else is using radios out there, hopefully before they know about us. If you have a lot of people in your group, and if you are using your radios a lot, it might be sensible to have multiple channels, plus a master emergency channel. Then you could have everyone in one team using one channel, and everyone in a different team or tasking unit using a different channel, and the two different sets of users not interfering with each other. At the same time, you’d also have both teams having a second global channel on their radios, so if there was any sort of emergency or community wide broadcast, everyone would get it on their second channel. There are ways to code the radios so they send specific inaudible tones or other types of signaling with every message they send out, and also so they will only play through the speaker messages they receive with specific tones on them, too. This is a very dangerous and widely misunderstood set of capabilities. They are useful and sometimes necessary when using a repeater – repeaters are commonly configured so they will only rebroadcast a message if the incoming message has an activating tone associated with it. The repeaters are configured this way as much to cut down on repeater to repeater interference as for any other reason, although they are sometimes also used as a small measure of access-restriction too. But for regular use within your community members, adding these types of tones seems to often result in someone’s radio being mis-configured and the person not hearing any messages, and his own messages in turn also not being heard. So generally we recommend you keep all these settings off. But there is one possible alternative factor to consider. If you were to have any opposing force take one of your radios, they’d then be able to monitor and even possibly jam your communications within your group. The radio they’d have seized would have all your channels programmed into it. If you configured vulnerable-to-being-taken radios to use some type of tone signaling, then this would (hopefully) not be intuitively obvious to the people who stole the radio. You could simply switch your other radios to another code (and there are hundreds to choose from) and that would probably be all you’d need to do to prevent the person with the stolen radio from listening in. Only if they had technical radio skills, and knew how to read the configuration of your radio and how to change it could they restore their ability to monitor your radio traffic. Note that if you use these types of tones to selectively block unwanted radio traffic within your network, it will not prevent other people (ie OpFor types) who already have radio receivers tuned to the frequencies you are using, from monitoring your transmissions. They would of course not have any of these selective block features enabled and so would hear all your transmissions. The recommendation to use the tones on your radios would only be beneficial if you were using unusual frequencies that any other people would be less likely to be monitoring. And, of course, if they did get one of your pre-configured radios, the recommendation again assumes (and assuming is never a good thing to do!) that they wouldn’t know either about ‘opening the squelch’ via the button on the side of the radio, or about reprogramming the radio to ignore the CTCSS or whatever control tones. So it might be beneficial, but it sure isn’t a guaranteed solution. This is an essential feature that we urge you to enable in your radios. Set the radio for automatic key lock any time the keyboard has not been used for a while. When your radio is locked, you’ll still be able to use the on/off/volume control and the push-to-talk button (and the other two side buttons too). But all the other keys are locked. This is a good thing – it means there’s no way you can accidentally bump the radio and change its frequency or one of its other settings. If you don’t have the radio locked, you will inevitably be bumping it against things from time to time, so it may not be on the channel or setting you need it to be on when either you urgently need to contact someone, or someone urgently needs to contact you. So set the radio to auto-lock. It is easy enough to unlock if you do need to change something – you just hold down the lock/unlock key for a couple of seconds. If you wish to scan a block of frequencies (and remembering that these radios are not at their best as scanners due to slow scanning speed and lack of sophisticated scanning features) you should consider what frequency step setting you have. The radios can be set to move from as little as 2.5 kHz up to as much as 25 kHz for each step while scanning and tuning. If you set it to 25 kHz and a sophisticated opponent is using nonstandard frequencies for his own radio communications, you might skip right past his frequencies and never detect them. For this type of purpose, it is better to set the frequency step low. The radio can be set to transmit with 1W or 4W of output power. This can be set channel by channel as appropriate. Although a lot of the time we are focused on getting the best possible range from a radio, there are exceptions to this case. Generally we recommend you transmit with the least amount of power necessary. This saves your battery, reduces the amount of radio frequency energy and any effects it may cause on you, and also limits the distance at which your communications can be overheard by other people. Sure, if you can’t be clearly heard at 1W, then by all means go up to 4W, because you have little choice. But if you are heard clearly at 4W, consider dropping down to 1W. The Baofeng radios are very popular, with the result there are lots of websites and user forums out there that discuss the radios. That’s the good news. The bad news is that some of the participants on these forums seem like recidivists from the ‘bad old days’ of CB radios in the 1970s – the real reason the CB radio ‘craze’ died out (in our opinion) is because the airwaves became infested with idiots who jammed up the channels and made the participation of ‘normal’ people into an unpleasant and difficult experience. Just as low-priced GMRS/FRS radios have sort of overwhelmed the FCC’s policing of the GMRS radio bands, the ready availability of low-priced HT sets like the UV-5R threatens to see the 2m and 70cm ham bands infested by such people, too. Fortunately – at least so far – the ham community has been vigilant at policing itself, and we hope that will continue to happen on the air, if not on the internet. There is an excellent website at http://www.miklor.com/ that is focused on all UV-5R related issues. It is well worth your while to read all the way through it. The material is generally accurate and helpful. There is an active Yahoo Group – http://groups.yahoo.com/group/baofeng_uv5r/ – that you might want to join as well. We’ve found that there’s a high proportion of nonsense messages in this group, alas; but if you can survive that for a few weeks, you might pick up some useful additional information, and it is easy enough to unsubscribe from the group again. Currently there are 7700 members of the group, and at least some of them are very helpful and sensible. Others however clearly don’t know what a ham license is, let alone have one. Your Baofeng UV-5R radios are capable of doing many things, and are flexible and versatile communication tools. Hopefully the information on this page will help you configure them to best reflect the operational needs and situation in which you are using them. If you’ve not already done so, we recommend you also read through our article A Complete System for your Baofeng UV-5R Radio – this gives you details of other accessories that you should get to extend the use and functionality of your radios. The Baofeng UV-5R series of radios – our recommended best choice. Update : This article is still very useful in terms of appreciating the issues surrounding how to make a choice of two-way radio. But the recommended choice in this article – the Baofeng UV-5R – has now been sort of superseded by a new model, the Baofeng F8HP. Click the link for an explanation of the differences. There are dozens – maybe hundreds – of radios being sold for use on the FRS and GMRS bands. Clearly some are better than others – and not so clearly, most are not very good at all. Which are the better and possibly best of the many radio choices? Before answering the question, may we ‘cheat’ a bit and redefine the question from ‘the best radio for FRS/GMRS’ and instead look at it from surely the better and broader perspective – the best radio for short-range wireless communications. The ugly truth is that all FRS radios are deliberately designed to be next to useless, and most consumer rather than professional grade GMRS radios are only slightly better. So, can we look at the broader topic of short-range radios, but we’ll keep the GMRS/FRS requirement in mind. By short-range we mean ‘tactical’ ranges based more or less on lines of sight – ie the ability to communicate reliably, probably up to a mile and definitely less than ten miles. In other words, you want to be able to communicate from anywhere on or immediately adjacent to your retreat property to anywhere else on or close to it. Of course the range of any radio depends massively on the terrain, so it is difficult to generalize and part of what you need to do once you’ve purchased radios is to then ‘map out’ your retreat and adjacent areas, testing communications to see if there are dead areas anywhere, ending up with some coverage maps, sort of like the wireless companies publish. If you have real problems with short-range radio coverage, you can consider an option to substantially extend the range by adding a repeater, and we’ll explain about repeaters in a subsequent article. The radio we are recommending is ‘repeater capable’, and the GMRS service allows for repeater type operation. So, what’s the best radio? That’s of course like asking how long is a piece of string, because any choice involves compromises between cost and features and portability and many other things (see our two-part Buyer’s Guide to FRS/GMRS Radios for more information on these issues). The radio we are recommending is a low-cost/high-value radio. It isn’t the best performing and doesn’t have the most features, but it is unbeatable from a value point of view. Now, before introducing you to the radio, some more introductory comments. Using Ham Radios for FRS/GMRS – Legal, Illegal, or a Grey Area? Okay, so remember our comment in our article ‘A Prepper’s Introduction to Walkie-Talkie Radios‘ – the part where we said ‘always follow the law’? We meant that when we said it, and we still mean it now. But….. It seems that perhaps the policing body, the FCC, doesn’t really care all that much, any more, about what happens on the FRS and GMRS frequencies, and as long as you don’t do anything too egregious, they may be content to ignore you. This is almost definitely true of the diminished need to get an $85 five-year license to operate on GMRS frequencies, and may also be true of the requirement to only use formally approved radios on the FRS and GMRS bands, or so this message in a Yahoo Group seems to hint at. We asked the message writer for clarification and he wrote back to us simply affirming that the Baofeng radios are okay to use on GMRS frequencies without showing any proof of his assertion, so make of that claim as you will (hint – a lot of nonsense is put forward as fact in many of these forums). We subsequently spoke to an official spokesperson at the FCC, but she first asked to only speak ‘off the record’, which we of course happily agreed to, and hoped that meant she would then speak frankly. Unfortunately she then proceeded to do nothing other than robotically repeat the official FCC regulations without giving any hint at all as to the real-world application of these regulations. However, she did disagree with the claim in the preceding paragraph that a radio that is not licensed for GMRS frequencies (Part 95 of their regulations) could be used on those frequencies if it was licensed to be used under similar frequencies by the FCC under either Part 90 (commercial land mobile use) or Part 97 (Ham radio operator) requirements. Maybe the most that can be said is that if you are using a unit that conforms to FCC specifications for the GMRS service, and if you use it appropriately without causing interference or problems to other users leading to complaints to the FCC, and without going overboard on transmit power, then perhaps – just possibly perhaps – no-one’s going to come knocking at your door. After all, if the radio conforms to FCC requirements, how would anyone even know that you were using a non-approved radio? It is only when you’re using a radio that doesn’t conform to their requirements (too broad a bandwidth, poor frequency control, too much power, etc) that you’re raising red flags in the broader radio using community (which does a fair amount of self-policing and reporting to the FCC about unlawful use) and possibly causing someone to complain to the FCC about you. If you do choose to use a ham radio on these ‘Part 95’ regulated bands (there are four Part 95 bands – CB, MURS, FRS and GMRS, and all are close to ham bands, with appropriate ham radios usually being capable of working on the nearby Part 95 band as well), then some advice. To avoid drawing attention to yourself, don’t use ‘high power’ on MURS frequencies. MURS service is limited to a maximum of 2W transmitter power, although it does allow for external antennas. Don’t transmit on the FRS channels at all. They are limited to 0.5W of power and don’t allow external antennas – if you suddenly started transmitting on the FRS band with a 5 or 50W transmitter and a super external antenna, you’d be very obviously contravening the regulations and inviting someone to file a complaint with the FCC. The FCC might not voluntarily hunt down offenders on its own initiative, but it will respond to complaints. GMRS service allows for external antennas, repeaters, and up to 50W of transmitter power. You can probably use reasonably powerful ham radios and with high quality antennas on the GMRS frequencies and no-one will be any the wiser. So, to answer the question we posed at the start of this section, in theory using unlicensed equipment on the GMRS or MURS bands is illegal, but if your transmissions conform to the other requirements of the band you are transmitting on, you’re probably happily in a grey area of non-enforcement – a bit like if you drive just a few mph over the speed limit on the open road. All these worries would of course evaporate if you obtained a Ham radio operator’s license. The lovely Baofeng UV-5R series of radios have just about every feature one could hope for in a mid-grade portable radio transceiver, and at a bargain price (typically around $40 each). They are not the best performing radios out there, but they are definitely the best value and have all the capabilities and options you are likely to need. They are also dual band, which means you could theoretically use them on both the MURS and GMRS bands. On the other hand, strictly speaking, although they are FCC certified for both Part 90 and 97 use, these radios are not certified for Part 95 use (ie on the GMRS, FRS and MURS bands). If there’s any way to discreetly use these radios without arousing the ire of the FCC (see the preceding section), then it would be great to be able to do so, and they are probably your very best choice of radio in terms of value and cost/performance compromise. Ideally, you should get a Technician level Ham license (see our article about getting your Ham license and our subsequent article about the easiest way to pass the Technician Ham License test) and then you can use the Baofeng units totally legally on the 70cm (similar to GMRS) and 2m (similar to MURS) Ham bands they support. Note – there are many different models in the UV-5R series. Some are described as ‘new for 2013’ or ‘improved’ or whatever else. They are all identical. The only difference is the model number (eg UV-5RE, UV-5RA, UV-5R+, and so on) and the external case design. This is the same as how some companies will make products for Costco with a different model number to the same product which is made for Walmart, and the same product with a different model number for other stores, too. Buy the cheapest UV-5R radios you can find – often they are on Amazon for under $35 and with free shipping, even though on the same page of listings you might see some ‘chancers’ trying to sell ‘improved’ units (which are identical) for $20 or more extra. Oh – you’ll also see different models get different review ratings on Amazon too. But, trust us with this. ALL the UV-5R units are identical. What’s that – you don’t trust us? That’s okay, you can prove it for yourself. Simply see the official FCC approval numbers. They are the same on the different models. Every different radio model with a change in its electronics needs a different approval number – the fact that all the UV-5Rs (even the F-22 models) have the same approval number seems clear proof to us that the radio is identical. It is that whole marketing thing with radios again – as we asked before, why is it that radio marketing keeps getting so terribly close to downright dishonesty? Like many other Chinese products, their manuals are not very well written. However, there is a huge community of enthusiastic users of these radios, and a couple of people have written their own very much better manual, which you can see here. We’ll be publishing a separate article shortly full of tips about how to best use your Baofeng radio. Oh, there are lots more Ham radio transceivers that are designed ostensibly for the Ham 440-450MHz (70cm) band that will also work on the GMRS 462-467MHz band too, but none of the other radios cost less than $100, and only when you start getting into the $200+ and $300+ units do you start to get units that are noticeably better than the lovely UV-5R units. Just for comparison purposes, here’s the probable ultimate in such radios – the Yaesu VX-8DR – where you’ll be politely asked to pay $500 per unit rather than under $50. We recommend the Baofeng UV-5R radio series as being the best value radio for most prepper’s local radio communication needs. Ideally, we urge you to get a Ham license and use it on ham radio bands rather than on GMRS and MURS, but it does seem that the FCC is being reasonably permissive about the use of such radios on the GMRS band in particular. The UV-5R radio, while good ‘out-of-the-box’, will work much better if you add some extra accessories to it. That will be the subject of our next article (please click on to read it). Update : As we said that the top, there’s now a new model Baofeng – the F8HP. It offers greater power, a better antenna, and longer battery life, but it costs twice as much (although that still means a cost below $65). Click the link to read our article about this new radio, then decide whether you want the UV-5R or F8HP. 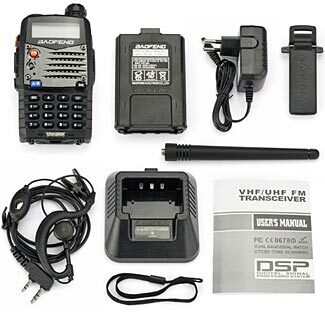 The UV-5R comes with some accessories to start with, but some additional items will make the radio much more valuable to you. In our immediately previous article, we recommended the Baofeng UV-5R and/or the Baofeng F8HP as the best general purpose two-way radio. When you buy a either radio, you usually get the radio in a kit that comes complete with standard Li-Ion battery pack, charger, carrying clip, wrist strap, rubber-ducky antenna, and earpiece/microphone. That’s a great set of goodies, all for about $35 or $65, but you should consider getting some accessories and additional items to add substantially to the radio’s performance and versatility. You want to have a better antenna, you must have a way to program the radio, and perhaps you’ll benefit from a spare battery or two as well. Indeed, with the radios so inexpensive, you should also get one (or more!) spare radios, too! The standard ‘rubber ducky’ antenna that the radio comes with has the benefit of being short (4¾”) and reasonably sturdy. But it is not an efficient radiator/receiver of radio signals. You’ll get a massively improved range if you replace this with a longer/better antenna. As we discussed in our article on How to Maximize the Range of your FRS/GMRS Radio, replacing the antenna can more than double the range of your unit and more than quadruple the effective power being radiated (or received). We suggest you also read our two-part article on adding and optimizing an external antenna to your radio, too. Noting the test results that were reported in by substituting a Nagoya 701 antenna for the standard antenna, this seems like a ‘must do’ item for everyone and all situations. The Nagoya 701 antenna is about the same weight, and 3″ longer (7¾”) but still more than sufficiently portable for almost all situations. There are many other antenna choices as well as the Nagoya 701; we feel the 701 represents an excellent compromise between size/convenience, performance, and cost, but you’ll be delighted with pretty much any other dual band portable antenna you choose. There is also a still longer Nagoya 771. This measures about 15¼” in length, but its greater length interferes with the portability of the radio and makes everything more awkward and clumsy, without adding any perceptible extra range. One word of warning. We have heard reports of fake/counterfeit Nagoya antennas out there – one way to tell if you have a real one or not is to read the label on the bottom of the antenna. A genuine antenna will refer to the frequency ranges of the antenna in MHz, a fake may instead say NHz (instead of MHz). If your antenna has this error, then it is probably not a genuine Nagoya. Note, when choosing a portable antenna you need to find one with a Female SMA type connector on its end, so as to mate with the male SMA connector on the radio itself. Otherwise, be sure to get the appropriate connector adapter as well. Nagoya 701 antenna – $10 or less on Amazon. Truly the best value you’ll ever get for less than $10 on improving your radio’s performance and range. One more thought : Antennas are semi-consumable items. That is, they are sometimes knocked about, and possibly damaged. They are also essential – no antenna means no working radio. At less than $10 each, we’d probably get one or two spares – maybe one spare for each four radios, ‘just in case’. The Baofeng radios have 128 programmable channels that you can define, and in each case you can set a lot of different parameters for the channel, ranging from bandwidth to power to offset frequencies if used with a repeater and CTCSS/DCS type tones on both the send and receive side of the channel. You can do this by hand, but it is cumbersome and slow to work through many different layers of menus to set all the attributes for each channel. If you get a programming cable and software, you can do this all from your computer, with a nice large interface screen to work on, reducing the time it would take you from hours of frustration (and possibly making errors that are hard to identify and correct) to minutes of simplicity. Even better, you can download preconfigured files of repeater frequencies from several different websites that will automatically program up your UV-5R or F8HP for you. Another huge time-saving is if you have multiple radios – you can create a series of configuration files and then quickly upload them to all the radios. This also ensures all radios are exactly configured the same, with much less potential for errors. The cable runs from your computer’s USB port to the external speaker/mike port on the phone. As for the supplied software, ignore it. There is much better free software, that runs on PCs, Macs, and Unix type computers (see our upcoming article on how to get the best use from your Baofeng radio for details on this). But you do need the programming cable, even if you don’t need the included software. A programming cable and software costs under $10 on Amazon. We consider it another ‘must have’ item. And, yes, you guessed right. At less than $10 each, this is another thing that it would pay to have at least one spare of – the cable isn’t just a cable, it also has some electronics built into it, so there is the possibility of failure. A second cable is cheap insurance. In truth, the units get excellent battery life from its provided battery. For the UV-5R, it is rated for 1800 mAh and is a 7.4V Li-ion type battery. The F8HP comes with a slightly more powerful 21oo mAh battery. Both are said to give ‘up to 12 hours’ of life, presumably with a duty cycle of something like 90% listening to nothing, 5% listening to a received signal, and 5% transmitting. Some reports have suggested that people have got more than 12 hours life out of it. You can get additional batteries as spares, of course, and at as little as $5-10 each, you’d be well advised to get a few. You can never have too many batteries, right? There is also an extended capacity battery available – some models claim 3600 mAh and others 3800 mAh – probably they are the same battery, just with different capacity claims. These are appreciably more pricey – $22 – $25 each. So in theory, you can get more battery for your money by buying standard sized batteries, and perhaps it is better, if you think you’ll need more reserve power, to simply stick a spare standard battery in your pocket than to use one bigger, heavier, and more expensive battery. Both types of battery are of course available at good prices on Amazon. There are two types of car power adapter for these radios. The first is a replacement battery back – you take off the regular battery and slide in this back instead, which runs via a coiled cord to a cigarette lighter power supply. The other option is intriguing, and you should get one of these too, whether your radios will be used in vehicles or not. It is a cord that plugs in to the cigarette lighter (or other 12V source of course) at one end and plugs into the power-in socket of the charger unit that was supplied as standard with the radio at the other end. The interesting thing about this device is that it gives you a convenient way of powering the standard charger and recharging batteries if your mains power is down. The other unit doesn’t recharge the battery, it replaces it instead. Both are helpful and useful. Normally we use the battery back replacement unit when we have a unit in a vehicle, but we have one of the other connectors as a ‘just in case’ unit so we are prepared if there’s a future grid-down scenario we need to cope with. Both types of units can be had for under $10 each at Amazon . If you plan to use your unit in your vehicle at all, then it makes sense to replace your already upgraded Nagoya portable antenna with a true ‘mobile’ type antenna mounted to the exterior of your vehicle. This will further improve the range with which the radio can send and receive signals. Again, we suggest you read through our two-part article series on upgrading/replacing your radio’s antenna for a thorough discussion of this issue. As for specific antennas, perhaps the least expensive and good performing antenna would be the Tram 1185 , which costs about $30. The only disadvantage is the wind noise that whistles through its coil; and if this is a nuisance, you could consider a more expensive antenna with a solid loading device rather than an open coil. Note you will probably need an adapter to match the fitting on the end of the antenna lead to the connector on the radio body (you need an SMA-F type connector to screw into the radio body output connector). In the specific case of the Tram 1185 (which ends with a PL-259 connector), this adapter does the trick perfectly. External antennas on cars have finite lives. Not only are they slightly stressed as you drive along the freeway at 70mph, but sooner or later, you’re going to drive underneath an object with little clearance, and it is going to collide with your antenna. Maybe the first few times, the antenna will survive, but eventually it will mechanically fail. It might break off its mounting, it might break in the middle if it is a multiple element antenna, or in some other way fail. If the antenna lead is just going through the seal in the vehicle’s door, then depending on the pressure being placed on it, maybe sooner or later the coax cable will short out. So you need some spares. But use this to your advantage. Don’t simply order a bulk quantity of identical antennas to start with. Order two different antennas, and then experiment to see which one you prefer in terms of performance and price. Then if you get a third antenna, you either know which of the first two is the better choice for you, or maybe you experiment further and get a third different antenna, giving you still more understanding of the ‘best’ antenna in your situation. You can then use that information to know which antenna make/model to get more of in the future. On the face of it, this might seem like a fairly unnecessary extra accessory, Sure, if you think you might have a use for it, you can get a speaker/microphone unit that connects via a coiled cord to the handset. That way you can have the radio clipped to your belt or securely mounted in the car, and conduct a conversation using the speaker/mike unit (which also has a push-to-talk button on it). But if you need to change any of the radio’s settings, then you’d of course still need to access the transceiver itself. But there are two important benefits that come from using one of these. One has to do with safety, the other with the range you’ll get from your radio. The UV-5R and F8HP manuals say you should keep the radio at least an inch from your head when transmitting, so as not to have problems with strong radio signals possibly harming your head and brain. While the radio’s frequencies are lower than cell phone frequencies, they are also potentially at least ten times stronger, so just as how it is good practice to always use a headset with a cell phone to keep the cell phone radiation level to a minimum, it is good practice to use some sort of similar device with your handheld radio transceiver. The other benefit is that if you don’t have to have the radio close to your mouth to speak in to it, you are free to locate it somewhere else for best signal transmission and reception. You can hold it away from yourself, so your body isn’t soaking up as much radio energy, and you can hold it up a foot or two over your head (you’d be amazed at how much extra signal boost this one simple thing will do). The good news is the radio comes complete with an included earpiece and microphone, which is all you really need to address these two issues. But if you don’t like sticking earpieces in your ears, then an external microphone/speaker is something to consider. They are not expensive, and when we looked at the low $10 – 15 or so cost of these accessories , we ended up getting a couple. You’ll need one of these to tune a mobile antenna to your radio (this is explained in the second part of our antenna series). If you have a friend already with a VHF/UHF SWR meter, you might think that all you need to do is borrow his. Sure, that would work for now, but you’ll find that you’ll be wanting to refer back to it surprisingly often – any time you move or change your external antenna, and, of course, WTSHTF, who knows where your friend and his SWR might be. So we recommend you buy one to keep as part of your radio kit. Using a SWR meter to tune your antenna will give you better range and protect the transmitter circuitry – it really is a must have device. There are good $40 units such as the Workman 104 , and better $60 dual/cross needle units such as this one . You only need one. You may also need to get more adapters to connect the SWR meter to the antenna and to the radio – if you can’t tell what you need, simply get the unit and see what can be connected and what you still need after it arrives. What else might you want? Maybe a protective case for the radio – they’re only $10 – $15, although with radios costing only $40 a piece, there’s not a great deal of need to spend too much on protecting them! On the other hand, in an uncertain future, you might not be able to buy replacements for love nor money, so taking care of your radios is just plain sensible. Especially if you wear them on your belt, there’s every chance you’ll occasionally bash them in to things, and for sure, you’ll drop them on the ground sometimes, too. So protective cases are probably a good idea. Maybe a directory listing repeater frequencies (although we found the directory most useful for pointing us to websites of local repeater frequency coordinator groups and then accessing their more up-to-date lists). And maybe some type of base station antenna to mount on your house/retreat roof, but that’s another subject worthy of its own separate discussion. The best value two-way HT type radio for most purposes is the Baofeng UV-5R or its slightly more powerful and expensive newer sibling, the Baofeng F8HP. They are both capable of transmitting on Ham frequencies, GMRS, FRS and MURS unlicensed frequencies, and land-mobile frequencies too. The radio by itself will benefit from adding additional options to it. We suggest the following should be on your ‘shopping list’, but you don’t need to buy everything all at once. Spare batteries – about $5 – 10 each – most of the time, the standard battery will be sufficient for an ordinary day’s operations, but it is good to have a few spares ‘just in case’ or for extended operations and in anticipation of batteries eventually failing and needing replacement. Mobile battery replacement and 12V charger power supply – about $5 – 10 each. Any time you expect to have a radio in your vehicle for more than a short time, it makes sense to switch from battery power to vehicle power. So we’d recommend one of these for each vehicle that will have a radio in it on a regular basis (the same as your plan for mobile antennas) plus a spare or two. The 12V charger power supply is a great product too, and we’d suggest one or two of those also. Programming cable and software – less than $10 – we’d probably get two, just to be on the safe side. External speaker/microphone – $10 – 15 – or otherwise use the included earpiece with each radio. SWR Meter – units are available in the $40 and $60 price range. You only need one, but you do need one to ensure best antenna matching on external antennas. Properly equipped, you’ll find your Baofeng radios a great choice and very helpful for your local/tactical communications. There are very many different sizes and styles of car antennas. All give much better performance than the short antenna on the radio itself. This is the first part of a two-part article – please also read part two – Installing an Antenna – for helpful further information on how to connect your antenna to your radio and how to ‘tune’ your antenna for best performance. Perhaps the easiest improvement you can make to a two-way radio is also one of the least expensive and definitely the one that will have the greatest impact on both your radio’s transmitting and receiving range. This is the replacement of the antenna. Although the concept of swapping one antenna for another sounds easy and simple, there are some issues and challenges associated with it. But – keep reading – we’ll help make the challenges easy and issues easily resolved. This article is designed for people using either Ham type VHF/UHF radios, or alternatively, MURS/GMRS radios. Much of what we say applies to CB radios too, except that their antennas are ideally very much larger (five times larger than 2m/GMRS and 15 times larger than 70cm/MURS). Note that FRS radios are not allowed to have external antennas, and if you have an HF or other less common Ham radio, then with your General or Extra license, you probably already know most of these things! If you have a base station or mobile two-way radio, it almost certainly does not have an antenna provided with it, and so you can skip the next section (but not the other sections). If you have a portable type walkie-talkie, then there’s a big question you first need to answer. Can Your Radio Accept an External Antenna? Okay, so the first consideration is whether or not your radio is even capable of accepting an external antenna. Hopefully, you used our two-part article ‘How to Choose the Best Walkie-Talkie‘ to help you select your Handheld Transceiver (HT) and one of the very first things we recommend in that article series is to get an HT that has a removable/replaceable antenna. If your radio has a fixed antenna, then you’re dead in the water and you need to start off by getting a better radio. Fortunately, that’s not a major investment these days – about $40 or so will get you a Baofeng UV-5R at Amazon and that’s more than good enough for most ordinary purposes (if you want an appreciably better radio, you’d need to almost add another zero to the cost of the UV-5R series). Antennas can have their efficiency measured, so as to give you an understanding of how ‘good’ they are. This is often referred to as the antenna’s gain. This measurement is in decibels, and is either measured in dBi or dBd units. What is the difference? To convert from dBi to dBd you subtract 2.15 from the dBi rating to get the equivalent dBd rating. For example, an antenna with a rating of 4dBi is the same as one with a rating of 1.85dBd. (In case you wondered, the ‘i’ means it is a measurement relative to an isotropic antenna, and the ‘d’ means it is a measurement relative to a dipole antenna, and dipoles have a 2.15dB gain compared to an isotropic antenna). Sometimes you’ll see an antenna that is described as having a certain dB gain, but the specification doesn’t indicate if it is in dBi units or dBd units. If the rating isn’t specified, you can safely assume it to be on the least favorable scale, ie, dBi. There are three main families of external antennas. There are short antennas designed to be used with handheld transceivers, larger mobile antennas suitable for mounting on a vehicle (either permanently or temporarily) and even larger antennas again for use with a fixed base station at your dwelling or retreat or office. Slightly different issues apply to choosing a fixed antenna for a base station – you can consider issues such as directionality of your antenna as well as antenna style and, most of all, antenna location (and coax cable run length) and those issues are beyond the scope of this article. Certainly, no matter what type of radio you have, you should have the best possible antennas at your main fixed bases, and these are issues we will consider separately. But for this article, we are focused on antennas that radiate more or less evenly in a full 360° circle around them, albeit ideally in a flat pattern rather than wasting signal sent directly up into the sky or down into the earth. The standard antenna your radio comes with – typically called a ‘rubber ducky’ – is not a very efficient antenna. It was designed to be short and convenient (and hopefully moderately sturdy too). But it was not designed for best performance. Fortunately, there are many other after-market antennas out there that give massively better performance. As we reported in our article on How to Maximize the Range of your Radio, swapping from the standard antenna to an after-market antenna improved the signal strength radiated by a small portable radio about eight-fold. That’s a huge improvement in signal strength, for probably a less than $20 cost. If the antennas you are selecting from quote their gain figure, then use that to help you evaluate the best antenna for your portable. Otherwise, a generally rule of thumb can be that the bigger the antenna the better (but make sure it is designed for the frequency bands you are wishing to use). And with antennas being such low-cost items, there’s no harm in buying two or three and then experimenting with them to see which works the best. You could even probably sell the ones you didn’t want on eBay or Craigslist for close to what you paid for them. Having a separate antenna for a radio being used as a mobile (ie in a vehicle rather than handheld ) provides two major benefits. The first benefit is that an antenna mounted on the outside of your vehicle is better than an antenna inside your vehicle. Not only is it slightly higher up and free from the partial shielding, obstructions, and absorbent materials inside the vehicle, but it may also have a better ground connection (using your entire vehicle as part of its overall antenna configuration) than is the case for a portable antenna on the radio itself. The second benefit is that it can be larger and therefore more efficient. It is common to note that many mobile antennas are coiled in the middle. There is one downside to such a design – the coil seems to act as a wind trap/musical instrument when driving down the road and particularly if your antenna is on your vehicle roof, you’ll get very much more wind noise inside the vehicle than you would with a different design of antenna. If you find yourself unable to get an alternate style of antenna, then you can modify your coiled antenna either by placing something around the outside of the coil or something on the inside of the coil – in both cases, to make it a solid object that doesn’t make as much of a whistling noise in the wind. Unfortunately though if you do this, you will increase the antenna’s wind resistance and may cause it to bend over more when driving down the road at freeway speeds, and the movement from vertical to angled will reduce the antenna’s functionality. Better to either accept the wind noise or to choose an antenna that doesn’t have the center coil in it. The best location for an external antenna is in the center of the vehicle’s roof. Sometimes this is not practical, but it should be your first choice whenever possible. You will probably have a multi-band radio – possibly with two, maybe even three ‘main’ VHF/UHF bands that you wish to communicate on. It seems that the 2m band is the most popular ham band, closely followed by the 70cm band, although this seems to vary somewhat from region to region. The 1.25m band is a very distant third – depending on your perspective you might see value in concentrating on popular bands or unpopular bands. If you are hoping to use existing repeaters out there, you should focus most on 2m and 70cm bands, but if you want to use a band which probably has fewer other people sharing with you, then the 1.25m band may be a better choice. One last comment about band choice. The 70cm band has a very broad range of frequencies (from 420 – 450 MHz), with a 3.5% spread above and below the central point of the band. The 2m band has only a 1.4% spread, and the 1.25m a 0.7% spread. This has some implications with antenna design – it is harder to get an antenna that works well all the way from 420 – 450 MHz than it is to get one which works well from 222 – 225 MHz. This is explained in the second part of this series, and we tell you how to turn this challenge into an advantage. Back to antenna issues, you can get a single antenna that is designed to work on both 2m and 70cm, and you can even get tri-band antennas that will work reasonably well on 1.25m too. This is normally the most convenient approach to adopt. But in your home/base station environment, you might want to have separate antennas for each band, and possibly even in a mobile environment too. Indeed, as well as having separate antennas, there is a lot of good sense in having separate radios for each band too – it can make monitoring and working on multiple frequencies much easier. On the other hand, if you’re not wanting to use existing repeaters, do you really need the extra flexibility – and extra hassle too – of having multiple bands? Why not then just concentrate on a few specific channels in only one band? If you know you’ll only be using a radio in one band, get an antenna optimized for that band. But if you want extra flexibility, then consider dual/tri band radios and dual/tri band antennas. For portable and mobile use, you seldom want a directional antenna, because you have no idea what direction you’ll be facing or where you’ll be communicating to. Instead, you want an antenna that radiates equally in all directions, 360° all around itself, but hopefully in a flat plane so the signal goes ‘straight out’ – ie perpendicular to the antenna mast itself, which you should generally hold as close to exactly vertical as conveniently possible. There is one exception to this. If you are only semi-mobile, and will be stationary at a particular location for a period of time, and if the person(s) you wish to communicate with are also at a known location, and if the reception is poor with normal omnidirectional antennas, perhaps you’d want to use a directional antenna in these cases. Directional antennas are much larger than regular antennas. The 70cm band is probably the most practical for directional antennas, because they can be much smaller and lighter than similarly directional antennas for the other two frequency bands (1.25m and 2m). If you are establishing a fixed ‘base station’ you might then consider a directional antenna if you knew that you’d always be wanting to communicate with people in one direction and almost never in other directions. There are many different types of directional antennas, with many different patterns of directionality, ranging from very tightly focused in one direction only, to broadly focused on perhaps about 270° which a relatively ‘blind spot’ for the other 90° (a cardioid pattern), to ones with a focus both front and back but not one the sides (a figure 8 type pattern). Even only a moderately directional antenna might give you five times more power in its main directional focus – and note that this focus applies not only for sending power out primarily in that direction, but also to receiving weaker signals more readily from that direction, too. The design and use of directional antennas is a fascinating subject but beyond the scope of this article. If you can see a situation where a directional antenna would be beneficial, you should definitely consider it further. This is the first part of a two-part article – please now read part two – Installing an Antenna – for helpful further information on how to connect your antenna to your radio and how to ‘tune’ your antenna for best performance. You don’t need to get this elaborate to experience a vastly improved signal with your radio. 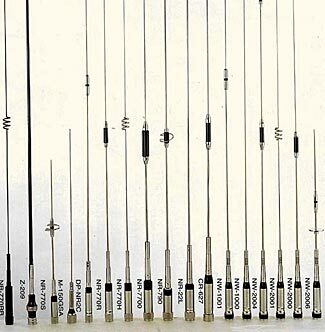 If you arrived first on this page, you might wish to first read Part 1 – Choosing an Antenna – before then reading this second part. After you’ve selected the best antenna for your needs (using the information in the first part of this article series to help) you now need to match the antenna to your radio, and to ‘tune’ it for best efficiency. Please keep reading for information on how to do these two essential things. This sounds like a simple process, but – alas – it is not. While the process itself is indeed simple – you connect your antenna to your radio – the complexity arises because different radios and different antennas use different sizes and shapes and genders of connectors. Murphy’s Law being what it is, there’s every good chance that the radio you have will have a different type of connector on its antenna output than your antenna will have at the end of its lead. There are a number of reasons why this mess of different connector types exists these days. There’s no ‘ideal’ connector size for our purposes, and you probably shouldn’t give too much thought as to the connector type used by specific radios or antennas – especially for mobile use. You have two choices after selecting your radio and antenna(s) – either get an adapter to connect from one style of connector (on the radio) to a different style of connector (on the antenna), or alternatively, if you are able to conveniently do so, cut the connector off the antenna lead and wire the lead up to the correct type of connector to work with the radio you have. This latter choice is slightly better, but is usually not practical for portable radio antennas, only for mobile and base station antennas. You want to have as strong as possible a mechanical connection between the antenna and the radio on a handheld portable unit, and if you start adding extra connectors, then you are weakening the connection, and the connectors are generally not designed to be load bearing devices. It is therefore highly recommended that you limit your antenna choice, for an HT, to only those antennas that have the correct connector built-in to their base. PL-259/SO-239 (‘UHF’ connectors) These connectors are sometimes referred to as ‘UHF’ connectors, although in strange contradiction to their name, they are not very good at UHF frequencies. This is because when they were given that name, the term ‘UHF’ referred to much lower frequencies than the term now refers to. They are however relatively sturdy and straightforward to specify and use. Male plugs (PL-259) are usually on antenna leads and female sockets (SO-239) are usually on radio outputs and SWR meters. SMA/RP-SMA These tiny connectors are clearly much better suited for the miniature size of today’s handheld/portable radios. Unfortunately, there is a confusing mess of different SMA and RP-SMA (reverse polarity) connectors and so you need to focus very carefully on two things. The first variable is whether you want a connector that screws into/over the other connector it is pairing with, or whether it has a threaded exterior that the other connector will screw into/over. The second variable is whether, in the middle/center of the connector, there is a hole for the lead from the other connector to be inserted into, or whether there is a sticking out ‘prong’ that will go into the other connector’s hole. Originally, connectors with external threads had internal holes and were called female SMA and those with internal prongs and external bolt type things that screwed into the other connector were called male. And that is sort of intuitively obvious, isn’t it. But now there are the RP series which combine a ‘female’ exterior thread concept with a male interior prong/hole concept. You also need to understand, when a device is described as using a certain type of SMA connector, does the description mean it needs this type of connector on the other piece of equipment, or has this type of connector on itself. You can guess at some of this (particularly the external threading) by looking at enlarged pictures of devices, but few pictures clearly show if there is a prong or hole in the center of the connector. BNC BNC connectors are back to simple and easily identified and understood territory again. There are two very obviously different types of connector, one fits over and around the other, and connects via a bayonet type twist/lock. Others Oh yes, there are lots of other types of connectors too. N connectors. TMC. Mini-UHF. And that’s just the start of the list! These less common types of connectors are not deal breakers, but it might take some more effort to find (or make) an adapter. The situation can become even more complex still when buying a mobile antenna. 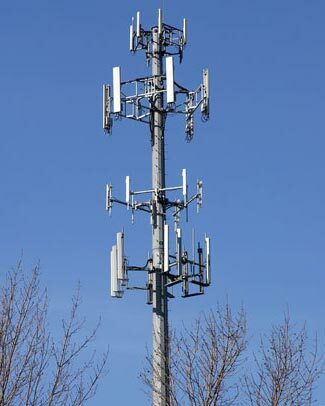 Some mobile antennas are nothing more than the antenna mast itself, with a screw thread on the bottom of the mast. If that is all you get, you then need a compatible mount to screw the antenna into. Unfortunately, there’s not one universal thread type or mast diameter, so you’ll need to carefully ensure that the diameters and threads are compatible between the actual antenna mast and the base it needs to be affixed to. But wait, there’s more. Maybe (or maybe not) the base mount device has a coaxial cable pre-wired into it, to enable the signal to be run between the radio and antenna. About the only good thing that can be said of a mount with no included cable is that you are then free to build a cable of the exact length you need, of the best type of coax cable, and with the correct connector on it. Other than that, it is a hassle. If you are fitting an antenna directly to your HT, there’s not much more you need to consider. But if you are adding a mobile or fixed antenna to your radio (HT, mobile or base) then there’s one more important step, and that is making sure your antenna matches the output of your radio as closely as possible – that is, your antenna is ‘tuned’ to your radio and its location. We’ll avoid the electrical theory and simply say that not all antennas are exactly matched with all radio transmitters. But – here’s the good news – it is usually possible to adjust (ie tune) the antenna to improve the match between it and the transmitter. This can make a big difference to the effective power transmitted from the antenna. The degree of efficiency of your antenna compared to your transmitter is termed its standing wave ratio, always abbreviated as its SWR. An ideal transmission system has an SWR of 1:1, meaning no power is reflected back from the antenna. A SWR value of 1.5:1 (usually just referred to as 1.5) means that there is a 4% loss of power, a SWR ratio of 2 means 11.1% loss, 2.5 is an 18.4% loss, and at 3.0, the loss has grown to 25%. This power is not just ‘lost’ – it is reflected back to the transmitting circuits and can damage them. It is hard to say at exactly what point a high SWR value changes from not just being a regrettable loss of power to becoming a dangerous amount of power being reflected back into the transmitter, and it probably varies depending on the design of the transmitter that is experiencing the reflected power. It is uncommon to see values lower/better than about 1.2, and if your SWR is above 3 or so, then that is perhaps becoming cause for concern. So for all reasons, you want to have an antenna with as low an SWR as possible. Although there two things to consider with SWR. The first is how to measure it, and the second is how to change it. To measure SWR, you need a special device – an SWR meter. These are readily available and not too expensive. SWR meters only work on some frequencies and are also power limited too, so you need to ensure that the SWR meter you get is designed to work with the frequencies you’ll be transmitting and can handle the power output of your transmitter. An SWR meter also needs to be of the same impedance as the feed line and antenna you are using – in our case, that is almost always 50 ohm, and you can assume that your meter is also 50 ohm unless it states to the contrary. Some SWR meters display their value by a needle moving on a scaled analog meter, others have two needles moving and you read the value from where the two needles intersect. It is unclear if the dual needle system is actually appreciably more accurate than a single needle system, especially for our type of ‘close enough is good enough’ purposes (as opposed to scientifically calibrating and measuring exact laboratory values). But dual needle systems do have one advantage. You don’t need to calibrate them every time before you take a reading. Calibration isn’t a difficult process to do with a single needle system, but the challenge comes when you forget to calibrate, meaning that perhaps you are getting an inaccurate reading and making the wrong assumptions. Note also it is important to attach the transmitter and antenna leads to the SWR meter the correct way around. If you swap them, you’re unlikely to harm the meter, but you’ll get an inaccurate reading. Fortunately, a basic SWR meter is not unduly expensive, and a unit such as this Workman 104 seems to represent as a good compromise between cost and functionality, and with a price of under $40 on Amazon, is good value too. The Workman 104 can handle power outputs of up to 150W and covers frequencies from 120 MHz – 500 MHz. and so is probably more than sufficient for your needs. If you wanted to treat yourself to a dual needle system, then this $60 unit on Amazon seems like the best choice currently. When you measure the SWR of your system, you should have your antenna mounted the way you will use it. In other words, if mounting an antenna on your vehicle, have the antenna already mounted where it will be on the vehicle (the SWR value will change depending on where on the vehicle the antenna is located). Some sources suggest you should also close the vehicle’s doors to further ensure that the system being measured is the same as the one the antenna will actually be used in. Once you have your SWR meter connected into your transmission line, you now want to take SWR readings across the band you want to transmit on. We suggest you get a piece of paper to write them down, because it can get confusing and you want to track what is happening when you make changes. Maybe have a set of columns for each different frequency you are taking readings at, plus another column where you can write what you did to change the setup from the previous set of measurements, and then one line for each set of measurements. The first part of changing your antenna’s SWR performance is to understand what it is at present and how you want to change it. The optimum solution is to have the SWR at the lowest in the part of the frequency band you’ll be using the most; the part that is most important to you. If you wish to be able to use the band equally, then the SWR should be lowest in the middle of the band. If by some happy chance, the SWR is already at a minimum at the key point of the band, then there’s nothing more you need to do. But if it is not, then you need to tune your antenna to move its ideal frequency from whatever it is to whatever you now wish it to be. There are many different ways an antenna can be tuned, but in the case of a typical mobile antenna, the most practical way is by varying its length. Pretty much every mobile antenna you’ll come across will have a way of adjusting the length of the antenna – usually there’s a tiny set-screw somewhere and when you loosen it, you can then slide a section of antenna up or down (or in and out of whatever it is sliding to/from) to adjust the antenna length. If you wish to raise the ideal frequency to a higher value, you need to shorten the antenna length. Do we need to add that if you wish to lower the ideal frequency, you need to increase the antenna length? Small adjustments can have big effects. Try adjusting the antenna length by perhaps half an inch and then redo your readings (remembering to recalibrate each time, of course). You can then see on your sheet of paper what the impact of the half-inch adjustment was, giving you a feeling for if you need to make more of an adjustment, or if you made too much of an adjustment, and so on. It will probably take a few adjustments to get things close to good, but it will be time well spent. It is relatively straightforward to tune an antenna for the 2m and 1.25m bands. This is because each of these bands is ‘narrow’ with not much difference between the upper and lower frequencies. The 2m band has only a 1.4% spread from its midpoint to its upper and lower limits, and the 1.25m band has an even tinier 0.7% spread. This means that sometimes you won’t see any difference in SWR across the entire band, because whatever change there might be is less than that which is picked up by the SWR meter. But that is not the same as having the antenna fully optimized. Maybe the SWR can still be improved – unless it is already very low (say less than 1.5) we’d recommend you test the antenna by increasing its length until you see the SWR change – does it go up or down? If the SWR is unchanged or reduces, keep adding to the antenna length until it is clear you’ve reached the minimum and the SWR starts to increase again. If even a slight increase in length immediately causes the SWR to increase, you should instead start shortening the antenna length until such time as the SWR has decreased to the minimum. Unlike the 2m and 1.25m bands, the 70cm band has a very broad range of frequencies (from 420 – 450 MHz), with a 3.5% spread above and below the central point of the band. This can mean that there is a large range in SWR values between one part of the band and another part of the band. That can be a nuisance if you wish to be able to transmit and receive all the way across the band, but if your main usage will be restricted to only communicating with other known users, we suggest you agree among yourselves on which part of the band you’ll use and so tune your antenna for best performance in that part of the band. An optimized antenna for your radio will give you more range for both sending and receiving than anything else you can do to your radio. Instead of spending many hundreds (or even thousands) of dollars on fancy radio transmitters and receivers (which will also use much more power – something that will be at a premium in any ‘grid-down’ type situation) you can instead spend a few tens of dollars on a better antenna and get the same end result – longer range and more resilient and reliable communication capabilities. The information in this two-part series and our other radio communication articles can help you choose the best radio and antenna for your requirements. This is the second part of a two-part article. If you have no already done so, you might wish to also read Part 1 – Choosing an Antenna – for additional information on getting the best antenna for your radio communication needs. We have a lot of other helpful articles about radio (and regular) communications too – please see our listing of Communications topics. Cell phone service can be disrupted either deliberately or unexpectedly. You can’t rely on it working when you most need it. Just hours ago, two bombs were detonated close to the finish line of the Boston marathon. At least one more has been found, unexploded. The count of killed and wounded is still progressing. The situation is now being featured in non-stop wall-to-wall coverage by all the networks, and one of the actual explosions was caught live on video and is being endlessly looped over and over again, with more video footage appearing all the time – an interesting example of how almost nothing these days escapes video recording. But, from our perspective, the really significant thing about this tragedy is what the authorities immediately did in response. It seems that at a federal level, a decision was made to shut down cell phone service across a wide part of central Boston. This was initially reported as ‘people were finding it difficult to get a cell phone signal due to everyone trying to use their phones at once’ but subsequently the reality became apparent – nameless authorities had instructed the wireless companies to block cell phone service from regular people with regular cell phones (security and first responder groups are sometimes equipped with phones that have special service designators that will continue to function when normal phone service is blocked). Interestingly, while a nameless official in DC said that cell phone service had been shut down, Verizon and Sprint both denied that claim, saying instead that the only call-blocking was due to increased traffic. Details on this link but note the text has changed a couple of times already, who only knows what it will say when you click on it! Perhaps it doesn’t even matter as to how it is that cell phone service was disrupted. The bottom line is that for many people, they were unable to call in or out of the affected area for an extended time period. There are several reasons why the authorities would block phone service. The first and most obvious is due to concerns that there may be other bombs out there with cell phone (or pager, if such things still exist) controlled detonators; by turning off the cell phone coverage, they prevent such bombs from being remotely triggered. The other reason is to prevent an attacking group of terrorists from coordinating their ongoing plan of attack (and making good their escape). Maybe other bombs are to be detonated by suicide bombers, or a timer to be initiated by a bomber who then endeavors to escape. If such people don’t get their activation instructions by text message or cell phone call, they hopefully won’t set their bombs off by themselves. Both these types of considerations are perfectly valid and make good sense. We understand and agree with the blocking of cell phone service in such cases. But. Imagine if you were in the affected area; or, alternatively, if a loved one was in the affected area. You’d want to urgently establish contact either to advise of your situation (if you were in the area) or to check (if calling to someone in the area) and finding cell phone service unavailable would be a major disruption. These days, with few or no pay phones, we have become increasingly reliant on our cell phones, and seldom pause to question our assumption that they are ideal emergency communication tools for us. The reality is that cell phone service is vulnerable to a number of potential problems that could interrupt their ability to provide reliable service in an emergency. Clearly the Boston Bombing shows one such vulnerability – a decision by the authorities to block all calls in or out of a region. And while on this occasion it was due to an apparent terrorist bombing, the increasing use of the internet by violent protesters to coordinate their protesting means that in other civil disorder events, there is an increasing temptation by the authorities to switch off cell phone service so as to disrupt the actions of the group the authorities are trying to put down. Other types of emergencies may cause other vulnerabilities to be exposed as well. A regional power outage will see cell phone towers dying as their emergency batteries, of varying capacity and run-time capability, run out of charge. An earthquake might physically disrupt service by toppling towers and breaking cables. An EMP attack would simply destroy the electronics in the towers (and possibly in your cell phone too). Fortunately, there is an alternative means of communication that is much more resilient and less likely to suffer outages from any of the preceding vulnerabilities. Good old-fashioned wireless radio – portable and car/mobile mounted walk-talkies. In an event such as the Boston Bombing, normal radio service would be expected to continue unabated. While walkie-talkies have very little range in a downtown situation, their range can be massively extended by any nearby repeaters, and most towns and cities of medium or larger size (and many smaller population centers too) have one or many repeaters that you could use to bounce your signal on from where you are to where you wish it to be received. To help you understand the prevalence of repeaters, have a look at this website (and others like it, some provide better coverage for some areas than others) and click-through to your state and county to see how many repeaters are in your area. Or do some searching to find the local repeater frequency coordinator for your area – we went and checked the service for Boston and found 26 repeaters within ten miles of Boston, twelve of which were within five miles (on either the 2m, 1.25m or 70cm bands). We suggest you Get a Technician class Ham License (click the link to see how easy this can be) and then always carry a small walkie-talkie radio with you. A Baofeng UV-5R would be an excellent choice, costing less than $50. We recommend disassembling it into three parts – the antenna, the battery and the radio itself. We’d pack the radio in a lightly vacuum sealed nylon barrier bag – just enough vacuum to cause the bag to drape moderately around the radio, but not too much as to risk puncturing the bag on sharp edges of the radio, or to potentially harm internal radio components such as electrolytic capacitors. Next, we’d wrap several layers of aluminum foil around the packed radio (to act as a Faraday cage in the event of an EMP attack) and then place that in a protective outer plastic bag (so as not to break the aluminum foil). Oh – we’d also have in the radio’s pack a sheet of paper showing all the relevant frequencies for repeaters and the channel numbers we’d programmed them in to the radio, plus our group’s cascading series of contact frequencies, so that when you open up the radio pack, you not only have the radio itself, but all you need to know about the frequencies to use. We’d probably include a copy of the radio’s instruction manual too for good measure. You keep the battery separate so as to conveniently recharge it every few months as it self-discharges. You keep the antenna separate for two reasons – to make the unit more compact to carry, and to stop the antenna increasing the radio’s vulnerability to EMP attack (yes, even with the radio off and battery removed, and even inside a Faraday cage, some vulnerability remains). If you needed to use the radio, it would only take a minute to remove the radio from its protective package, screw in the antenna, and click the battery in to place, and then you’d have a working radio, suitable to use contacting other members of your extended family and retreat group (who also should have radios too of course). In a more serious event where the repeaters might be compromised and also cease functioning, it should be part of your plan to exit the city area as best you can, and to monitor/call other group members at designated times – maybe for five minutes, once every 30 minutes, commencing at 10 and 40 minutes past each hour – until such time as you make contact with each other, either by radio or by meeting up at an agreed assembly point. A resilient communications strategy that will ensure the members of your group can reliably keep in contact with each other and coordinate their actions and movements is an essential part of surviving both the immediate effects of an unexpected event and the ongoing problems that may ensue. For information on how to plan your communications prepping, please read through our ongoing series on Communications in general, and in particular those articles that relate to wireless/walkie-talkie communications. While cell phones are generally better than two-way radios for most ordinary communication requirements, they are also much more reliant on everything outside of our control continuing to work as it normally does, and as preppers, that’s an assumption we can’t comfortably accept. This looks – and is – overwhelmingly complicated. But Ham radio doesn’t need to be like this, it can be simple and straightforward for everyone. This is the first part of a two-part series on how to most readily pass your Ham licenses. After reading this first part, please be sure to click on to the second part ‘Learning and Study Aids to Help You Pass Your Ham License Test‘. If you get a Ham radio operator’s license, you will be able to legally use the widest range of radios and frequencies, and at much greater power levels than are permitted for unlicensed radio users. You’ll be able to communicate more reliably in your immediate area (ie line-of-sight, stretching out a mile or more depending on topography and obstructions) as well as in a broader region (via relays) and also nationally and even internationally too. If you limit yourself only to unlicensed FRS, GMRS, MURS and CB type radio services, you’ll be limiting your communication range, usually to something less than a mile, also depending on the topography and obstructions. So, a Ham license is the way to go, and getting one is easier than you think. We discuss the three different types of licenses on our page ‘Why You Should Get a Ham Radio Operator License‘, and no matter if you decide to settle for the entry-level ‘Technician’ class license or if you decide to pursue the ultimate ‘Extra’ class license, you will face common requirements and be tested in a similar format. The strategies we offer, below, will apply equally to all three licenses. One of the big hang-ups many people used to have, was the need to learn Morse Code as part of the licensing/testing procedure. This is no longer required, so if that was a concern and something holding you back, it is no longer a reason to not get a Ham license. On the other hand, once you’ve got your three levels of Ham license, we’d suggest you consider voluntarily learning Morse code. Believe it or not, there are still occasions when it can be useful, and it can also improve your Op-sec – while anyone can go out and buy a radio scanner and listen in on your voice transmissions, very few ‘bad guys’ will go to the lengths of learning Morse code and deciphering your Morse transmissions. These days there are three main Ham licenses available – they are called the Technician, General and Extra licenses. The General license gives you all the privileges of the Technician license plus adds more frequencies you can also use, and the Extra license gives you all the privileges of the General license plus adds still more frequencies, and also allows you to then get a ‘vanity’ Ham call sign (fewer characters and more choices than the auto-assigned ones you are given to start with). To get a Technician license, you sit a single multi-choice exam where you are asked 35 multi choice questions, each with four answer choices. You are required to get 26 questions correct to pass. The 35 questions are semi-randomly drawn from a question pool of about 400 questions. To get a General license, you first need to pass your Technician test, and then sit a second test, also comprising 35 multi-choice questions, each with four answer choices, and you again must get 26 correct. The General question pool is slightly larger, and has different questions to the Technician pool – there are about 460 questions in the General pool. To get an Extra license, you first need to have passed your Technician and General tests, and then sit a third test. This time you have 50 multi-choice questions, still with four answer choices each, and you must get 37 correct to pass. The Extra question pool is quite a lot larger, with about 700 questions in it, and these questions are generally different (but sometimes similar and of course directly related) to the questions in the other two question pools. The question pools and the correct answers are widely distributed so you know in advance exactly what you need to study and what questions you might be asked. It is possible to sit for one test, pass it, and then immediately sit for a second test in the same session. 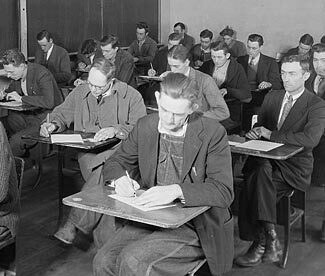 Some people – this is rare but occasionally happens – sit for all three tests in a row (and pass all three, too). Which leads to the first strategy. We’re not saying you should try to do all three tests on the same day, indeed, unless you already know a lot about the subjects covered, we’d recommend you don’t try to do this. It might give you some boasting rights to pass all three tests in one day, but it might also overwhelm you with the learning needed, and you will probably find it overall quicker as well as much easier to do the tests in easy ‘bite sized’ stages. Although we don’t suggest doing all three tests on the same day, we are suggesting that you should steadily go through all three tests, perhaps one a month, because each test builds on knowledge you will have learned for the previous test. It is better that you soon get a Technician license, then a month later the General, and another month later the Expert, than perhaps end up learning solidly for six months before sitting any tests at all. One more thing about timing. Keep at it, steadily. If you wait too long between one test and the next, you’ll have to relearn much of what you knew after passing your previous test – it is much easier to simply keep moving forward while everything is fresh and still in your mind. Each test is created by choosing, on a semi-random basis, a selection of questions from that test’s pool of questions. The questions are grouped into a series of ten different subjects, ranging from the rules and regulations associated with operating a ham radio station to safety procedures, and of course including subjects such as antenna design, radio wave propagation, and electronic circuits. Now, note the use of the term ‘semi-random’. A certain number of questions are taken from each of these ten different subjects – for example, with the General test, five questions come from the Amateur Radio Principles group, but only two from the Electrical and RF Safety group. So here’s the strategy. If you find one subject easy and another difficult, maybe you don’t need to study the difficult subject at all. Remember you only need 26 correct answers from 35 questions for the Technician and General tests, and 37 out of 50 for the Advanced test, so you can ‘sacrifice’ some parts of the knowledge you need entirely. In other words, learn all the easy stuff first, and then only as much hard stuff as you need to be sure you can get up to the score you need to pass. So you now know there are ten subjects that the test covers, and we’ve indicated that if there’s a subject you just can’t understand at all, maybe you can skip it entirely and still be able to pass the test due to the generous number of incorrect answers you are allowed. The testing is actually even more structured that this. Within each subject category there are a number of subsections. So maybe you’ll find that one subsection is easy and another hard – rather than make a decision to study or abandon the entire subject, just pick and choose the subsections that you understand and make sure you are fully optimized on those questions. Only when you have the easy stuff mastered do you need to return to the more difficult subsections. Now here’s a suggestion that can massively help you direct your studies most productively. Each of the ten subjects has a number of subsections, as discussed in the preceding section. As if by coincidence, the number of questions allocated to each subject is the same as the number of subsections in the subject, and so it is common for an exam to allocate one question to the material in each subsection. Now for the interesting thing – some subsections only have half a dozen or so questions, while others have more than a dozen. So, guess what. If you study a subsection with half as many questions in it as another subsection, each of the questions and answers you are learning is twice as likely to be asked. What is the point in struggling with a question that has perhaps only a 5% chance of being asked, when there is another question with a 10% chance of being asked that you could learn in the same amount of time? Or, to phrase it a different way, which is easier for you – to learn a group of six question/answer sets, from which you expect one question to be asked in your exam, or to learn a group of 12 (or even 20) question/answer sets, from which also only one question will be asked. So, when you’ve polished up on the easy subsections, your next strategy should be to concentrate on the harder subsections with the fewest number of questions in them. This will give you the best results from the time you spend. The good news is that the questions are multi-choice and that each question has only four answers to choose from. Furthermore, you don’t lose points by choosing wrong answers. So, of course, answer all questions, even if it is only a WAG (wild assed guess). Fortunately, you can sometimes improve your guess by eliminating one of more of the answers not so much based on what you know is right but rather based on what you know is wrong. We’ll go through some examples here, and to prove our point, we’ll use the most difficult Extra exam questions rather than the simplest Technician exam questions. What types of amateur stations may automatically retransmit the radio signals of other amateur stations? Now maybe you’ve no idea what the answer is, but perhaps you also know that a beacon does nothing other than simply broadcast a signal of some sort, maybe for radio direction finding, maybe to test propagation, or for some other purpose. A beacon clearly does not retransmit signals from other stations. So that would enable you to eliminate answers A and D, leaving only two to choose/guess from. If you look at the two remaining choices, you might wonder about a model craft rebroadcasting signals, decide that was slightly strange, whereas the three choices in B include one that on the face of it looks obviously correct (repeater), and two that could be correct, and decide to choose answer B. So, without knowing the answer, you’ve eliminated the probably-wrong answers to come to the probably right answer. Well done – you’ve now mastered one of the Extra test questions. What is the amateur satellite service? You can see that answers C and D are sort of similar, whereas options A and B are quite different from each other (and from answers C & D too). It seems common in such cases that the examiners have created two ridiculous answers to trick people who know nothing about the topic, and then two similar answers to see if people really know the answer or are slightly confused. So if you didn’t know the answer for sure, we’d suggest guessing between answers C and D. And if you had to carefully select either C or D, we’d point out that answer D talks about public service broadcast whereas answer C talks about amateur radio stations. Which do you think more likely to be something to do with the amateur satellite service – amateur radio stations on satellites, or public service broadcasts. Yes, option C is correct, and you’ve now answered two of the Extra exam questions purely by applying logic to the questions rather than based on specific knowledge of the subject. What is the phase angle between the voltage across and the current through a series RLC circuit if XC is 100 ohms, R is 100 ohms, and XL is 75 ohms? In this case, there are two parts to the answer – is the angle likely to be 14 degrees or 76 degrees, and will voltage lag or lead current? You do need to know some of the theory to get this right, but you don’t need to know the exact formula. Both parts are easy to guess with only a little theory. The first part – the angle – if you see there is 100 ohms of resistance and a net of 25 ohms of reactance, then that implies the angle will be small rather than large (because most of the circuit is resistance). So it would be a safe bet that the angle is more likely to be 14° which is relatively small, rather than 76° which is of course relatively large. Now, will voltage lead or lag current? You see that the capacitance is larger than the inductance, so the dominant effect will be caused by the capacitance. Hopefully you know that with a capacitor, there is a rush of current into the capacitor, and the voltage builds up subsequently while the current flow slows down – in other words, voltage lags current. If you know either of these two general principles, you can eliminate two of the four answers, And if you know both principles, you can correctly guess answer A without needing to know the formula involved at all. Maybe you don’t know the answer, but there are some clues in the four choices as to which answers are wrong. For example, look at answer B, which claims that an attenuator reduces loss. If you have even the simplest understanding of an attenuator, you’ll know that although it does indeed reduce a thing, but that the reduction – in this case of signal – would thereby increase loss. So answer B is out. If you have studied antennas, you’ll know that an isotropic antenna is a theoretical concept that is impossible to exist or create in real life, so therefore, answer C which refers to the attenuator being used in conjunction with this non-existent device is also obviously wrong. As for the other two, it seems intuitive that an attenuator might reduce overload, although maybe you’ve no idea whether that would help determine peaks and nulls or not – maybe you don’t even know what peaks and nulls are, but the part you do understand sounds reasonable. The last option might be something that you simply don’t understand at all, and so in that case, when forced to choose between an answer that seems at least half right, and one which you don’t understand, why not choose the one which is at least half right. After all, sometimes the reason that one of the other answers is not something you understand or recognize is because the fun-loving examiners created it as a credible sounding but utterly nonsense statement! Oh yes – if you chose answer A, you’ve just got another of the Extra exam questions correct. Congratulations! As you study for your tests, you want to do three things each time you come across a question you can’t answer correctly. First, of course, ideally you should study and learn the materials needed to understand the topic being questioned. That’s also the most time consuming and difficult approach. So, the second thing to do is to study the question and the four answer choices, and from the benefit of knowing the correct answer, see if you can analyze the question and answers so that even if you can’t clearly be sure of the right answer, you can perhaps become more certain that some of the four choices are obviously wrong. Learning which answers are wrong (and why) is almost as helpful as learning which answer is right, and sometimes can be a quicker and easier strategy. The third thing to do is to just use ‘brute force’ and rote learn the question and its answer. To do this, try to see if there’s a clue or mnemonic you can create from the question to guide you to the appropriate answer. I’ve used all sorts of mnemonic ‘tricks’ to remember answers to questions – and sometimes to group answers to a series of questions – for example, there were a series of questions about what happens with either a 1/4 or 1/8 wavelength antenna was either shorted or open at the end, and so I remembered ‘SHOL4’ – Short High, Open Low (impedance) for the 1/4 wavelength (and the opposites for the 1/8th wavelength). That one mnemonic walked me through four different scenarios. The Pointing iN Proudly mnemonic helps to remember the difference between the symbols for PNP and NPN transistors (the arrow points iN for a PNP device). And so on for many of the other questions – sometimes it is just something like ‘only one of the four answers has an odd number, and that is the right answer’). There are two things you have to be very careful to not do. The first is don’t memorize answers on the basis of ‘the second answer is the correct answer to this question’. It is very easy to do this, either consciously or unconsciously, because as you see the same question/answer repeatedly, you may build up an almost Pavlovian response of quickly zeroing in on the correct answer based on where it is rather than what it says. I unconsciously did that myself for the first of the three tests, and then discovered to my horror, when sitting the test, that the order the answers were presented in had been shifted from the order they were shown in the practice tests I’d been doing. Without realizing it, I’d been instinctively choosing things like ‘the second answer’ for some of the questions, and then I realized that the answers were jumbled up and I had to stop and rethink the answers more carefully. Make sure the sample tests you are taking jumble up the order of the answers they present to you. If they don’t, then try using several of the different online sample test services. The second is a subtle derivation of the first trap. We urge you to try sample tests in different formats. It just seems that one becomes familiar and comfortable with test exams in one style of presentation, and so when confronted with a different layout and format, it seems unfamiliar and the questions/answers look ‘foreign’ and different and harder. It seems that even if you are careful not to ‘learn’ answers by their position in the list of four choices, sometimes you key in on links between the question and the answer based perhaps on the way the question is written – your eye goes straight to something like ‘the third word on the second line’ and based on that, then knows the answer to choose. So when that key word or phrase has shifted in location, you no longer have the key between the question and its correct answer. Sample tests that randomly shift the answer order around never randomly shift the layout of the questions around, so this remains as a potential problem. We strongly recommend you should use several of the different free services for taking sample tests, so that your knowledge becomes separate from the presentation of the test materials. The format of the actual tests you’ll take will be different to any of the online tests (for one thing, it is printed out rather than on a screen) and so by getting experience with several different formats and presentations, you’ll take another format and presentation in your stride. Your Ham License study and exam is not like this – it can be relaxed, informal, and relatively easy. This is the second part of an article series full of tips and strategies for making it easier to pass your Ham License Exam. If you directly arrived on this page, you might want to first read the first part ‘Ham Test Exam Passing Strategies‘ then read this part, which focuses on learning and study aids, second. There are plenty of websites with lists of the questions and answers for the three tests, and sites which will create sample tests and score them for you, so you can see if you’re getting close to being able to pass the test or not in something similar to a real test. These are useful but only part of the process. And note, from the immediately preceding paragraph, that if you are running sample tests, it is really helpful to use either different sites on different occasions or a site that randomizes the order in which the answers are listed each time you do the test; otherwise you run the risk of remembering the answer position rather than answer context. There are two excellent overall learning approaches to consider. The best overall approach is to get the combination book and software for each of the three courses that is published by the ARRL (the main amateur radio organization in the US). They offer sets for the Technician License, the General License, and of course, the third in the series, for the Extra License. These are reasonably priced (the Amazon links above show pricing currently in the range of $21, $27 and $29) and each has a large (8.5″ x 11″) softcover manual plus a Windows CD with teaching and testing software on it. The books range up to 460 pages in length and do double duty as ongoing reference manuals. They are very sensibly laid out both to help you learn the tests and also to gain a broad knowledge in general. The good news though is you don’t need to read and understand and memorize every page of every book. You can simply zip straight to the section on any question or series of questions you need to brush up on, and even see in the text mentions of which parts of the text relate exactly to which questions. So you have the choice of either building up your general radio knowledge, or of ‘rifle shot’ selectively learning only the key points needed for each exam. The computer training and testing is also very good. It can generate tests, the same as free sites, and will also allow you to selectively study parts or all of the questions for each level. Best of all, it will give you not just the answers but also explanations of how and why the answer was obtained. These three books and the associated software might be all you need, especially if you already have some general grounding in electrical and electronic theory. We suggest you get them first, and then if you feel the need for extra support, move on to the next item. There’s also a good – but not perfect – web-based training/testing program calling itself HamTestOnline. This is very nicely designed and set out, and uses very clever training routines to help you learn the material you need, repeating parts automatically until you show you’ve mastered it, and making the process about as painless as possible. They sell a two-year access to their site for $25, $30 or $35 depending on which of the three classes you want to use. We like it being web-based – it therefore works on all types of computers and tablets, and doesn’t clutter your computer up with more programs. There is a generous amount available for free, so give it a free trial and if you like it, and particularly if you are finding it hard going with just the ARRL books recommended above, you might find it extra money well spent over and above the ARRL manual and CD. Our quibble with this service, and the reason we’re not giving it a higher recommendation is that, while the testing process they take you through is excellent, many sections are light on actual teaching materials. It is excellent at helping you to get the answers right, but not nearly so good at helping you learn the underlying information needed to understand the questions and answer choices. For example, the section on Oscilloscopes comprised a quick outline and then a couple of links to take you to, eg, the Wikipedia article on oscilloscopes. Then when they asked you the relevant questions on oscilloscopes, there was no supporting material actually as part of their service to teach you what you needed to know to get the right answers. This is repeated in most other sections of their materials. This service is primarily an intelligent augmented testing program rather than an actual learning program. I’m not sure that it is entirely fair to take $25 or more from a person and then – in some but not all cases – simply send them off to read a generic article on Wikipedia! I want to be told exactly the focused relevant information I need, and to have each question associated with on-topic explanations of why the correct answer is correct, and why the other three are wrong. HamTestOnline doesn’t offer the focused directed learning, closely linked to the test questions. On the other hand, the ARRL books do, but with much more simplistic exam preparation software. For the easiest of the three tests – the Technician level test – I was able to prepare and pass the exam with little need for any study at all, primarily drawing on high school and college physics and related knowledge. For the General test, I had to work hard through the ARRL materials, and while I started trying to prepare for the Extra test with only the ARRL materials, I found it tremendously easier to rely mainly on the HamTestOnline service to prepare for this exam, occasionally referring to the ARRL materials for explanations. HamTestOnline offers a very good way of working through the test questions (in their ‘study’ section) as a positive and effective way of learning. If you find the ARRL books and CD program isn’t a positive enough experience or isn’t bringing you up in speed to the point where you are consistently passing practice tests with a comfortable safety margin, you should definitely sign up for HamTestOnline too. Another option is to go along to a class or series of classes offered by a local Ham operators group. If you really want to know and understand the subjects being taught and tested, there’s no better approach than this. But if you just want to quickly pass the tests, this will be the least productive use of your time. HamTestOnline say that it typically takes ten hours of study to be able to pass the Technician test, another 20 for the General test, and a further 30 for the Extra test. Of course it really depends on if you’re starting with zero knowledge of electrical and electronic principles or not, and also if you’re a fast learner or more average on the uptake (and you can even change a setting in their adaptive learning for how fast you are picking up the concepts compared to how much revising you need). Even if you take twice as long as they say, twenty hours of study to get a Ham license isn’t a huge chunk out of your life, is it. An hour a day for three weeks is all you need to set aside. Who can’t manage that? If you live in a medium or larger sized city, the chances are there are one or more than one organizations that have a regular schedule of conducting tests for your Ham licenses. You can see a list of nearby test dates, times and locations here. Most of the time, all you need to do is show up perhaps 15 – 30 minutes before the test is scheduled to start, pay perhaps a $15 or so fee, show ID to prove you are who you say you are, and you can then sit one, two, or all three tests in a row (the fee covers all the tests you might take that session). There’s no time limit on the test, so you can carefully work your way through the questions without feeling any pressure or panic. Some experts say you shouldn’t do desperate last-minute revision prior to taking any test, but in the case of these tests, I disagree. I found it helpful to quickly brush up on some of the areas I was unfamiliar with prior to going in to take the test, and in all three tests, I found some of the questions in the test were questions I’d revised just an hour or less before, and that helped me more confidently choose the answers. Who doesn’t wish for a second chance in life! Here’s a way you can get a second chance at passing your Ham License test. If you narrowly fail when you go for your exam, (for example, if you get 24 or 25 out of 35 instead of the 26+ you need to pass) and if you’ve been scoring 26 or better in practice tests at home, why not ask permission to take the test a second time. This is permissible under the ARRL/VEC testing rules. You would have to pay a second testing fee, and would be given a different set of random questions, but if you feel your first test result was randomly less than you were capable of, with a large percentage of ‘hard’ questions, maybe simply immediately re-sitting the test might get you a better score and have you passing. Anyone of average intelligence can readily master the limited amount of information needed to pass any of the three Ham license tests. Heck, if I can do it, I’m sure you can, too! The benefits from having done this can be potentially enormous after TEOTWAWKI. Although the easiest way to pass the test is to selectively learn only the information needed to answer the 350 – 700 questions in each of the three question pools, you’ll get even more benefit by a broader understanding of how radios work and how to get best use from them. This is the second part of an article series full of tips and strategies for making it easier to pass your Ham License Exam. If you haven’t already done so, you should also read the first part ‘Ham Test Exam Passing Strategies‘ for lots of tips and ‘tricks’ as to how to most positively pass your ham tests.